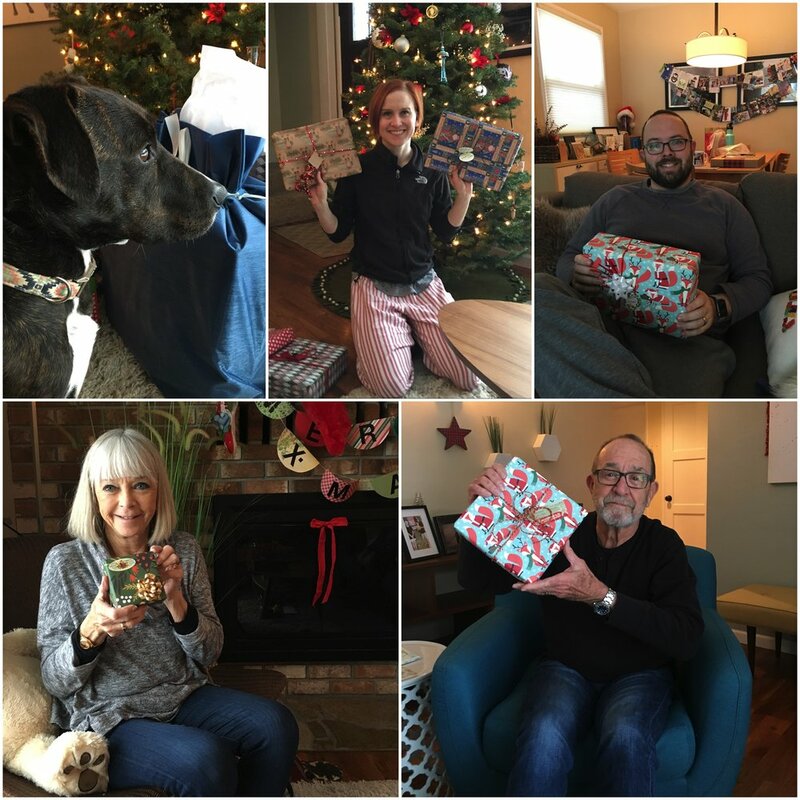 Wow, what a Christmas! 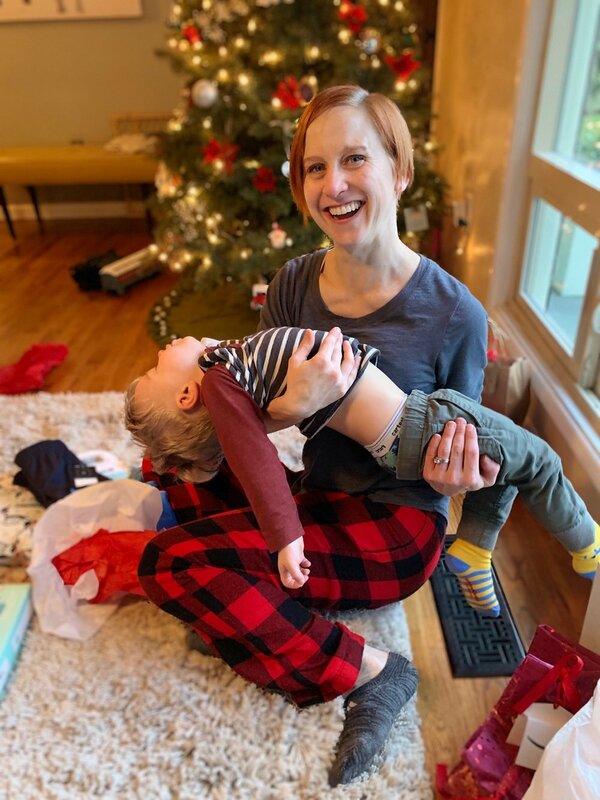 It’s been a whirlwind for sure with a newborn and toddler, but it’s been a most wonderful holiday season. My parents came into town for Christmas and we’ve been spending some quality time with them. 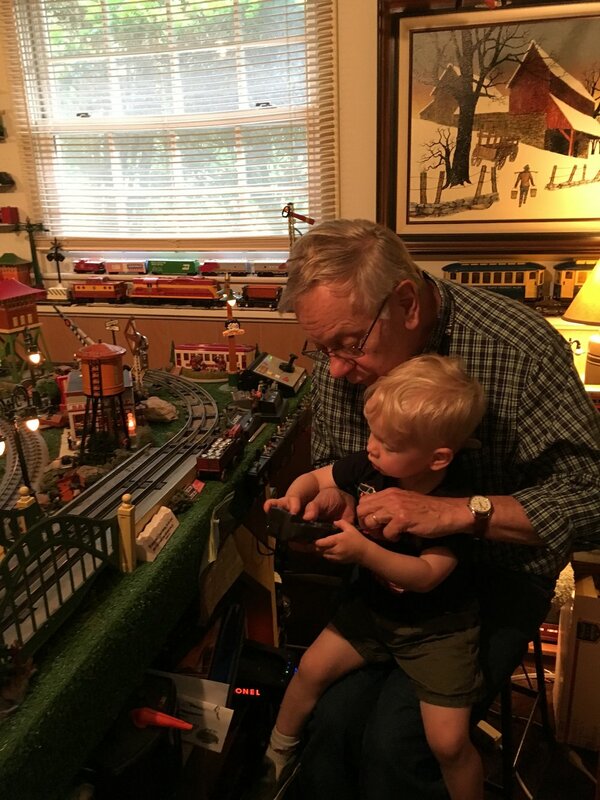 They are soaking in all the baby cuddles from Wesley and getting to play trains with Caleb = happy grandparents. We’re behind on getting our Christmas card out this year, so we’re aiming for a New Year’s card. Thanks to technology, though, you can read our Christmas letter right now (<—just click!). I See You, Close Up! Merry Christmas! This year has be pretty magical and full of cheer. We feel so very blessed. In the spring we found out we would have an addition to our family and we were overjoyed. Wesley Jackson Brown just recently joined the family officially on December 7th. 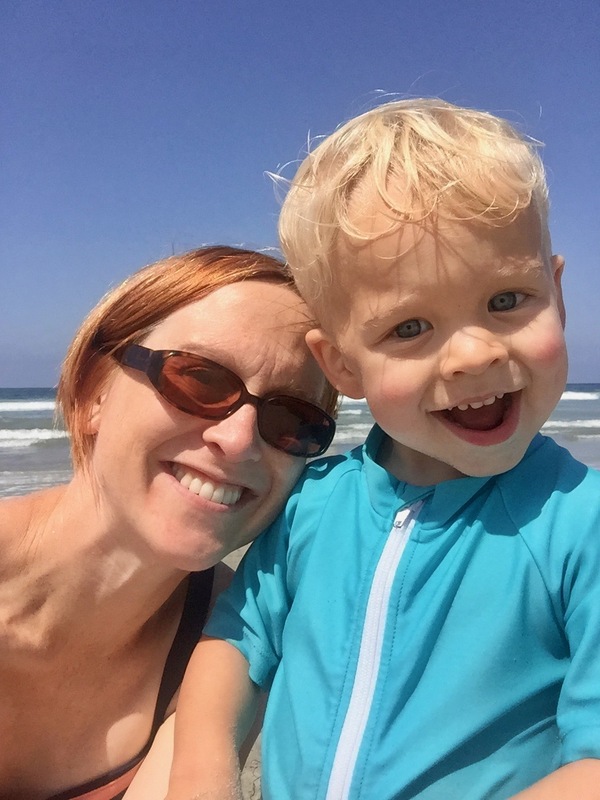 He has proven already to be his own person by arriving later than the due date — unlike his brother. We were waiting and expecting him the whole month of November, only to find he wanted to wait until December! Caleb is doing great as a big brother. He wants Wesley to come with us everywhere, which of course he will. He also runs to him in the morning and after nap to say hello. I have a feeling they are going to get along just fine. Here’s a video of some of their first interactions. 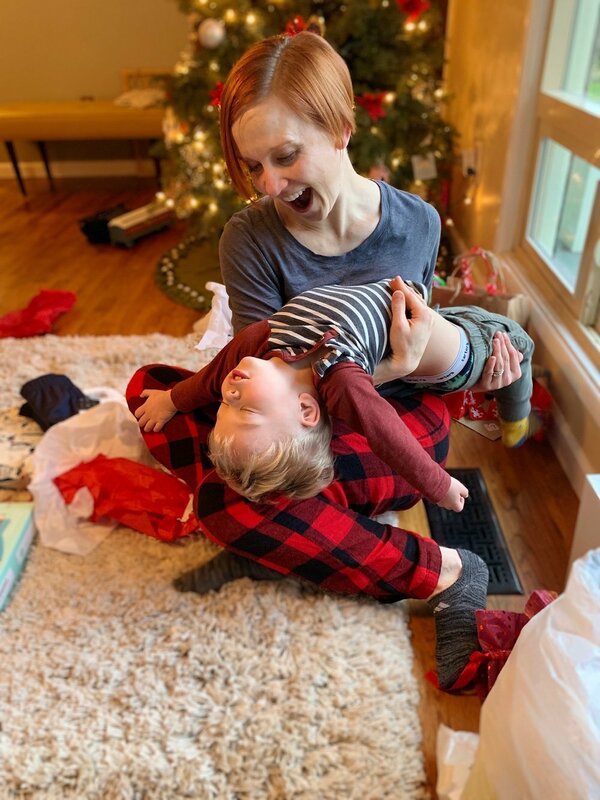 Wesley is our sweet, little Christmas-time baby and we are so in love. Being a family of four is already proving to be great. 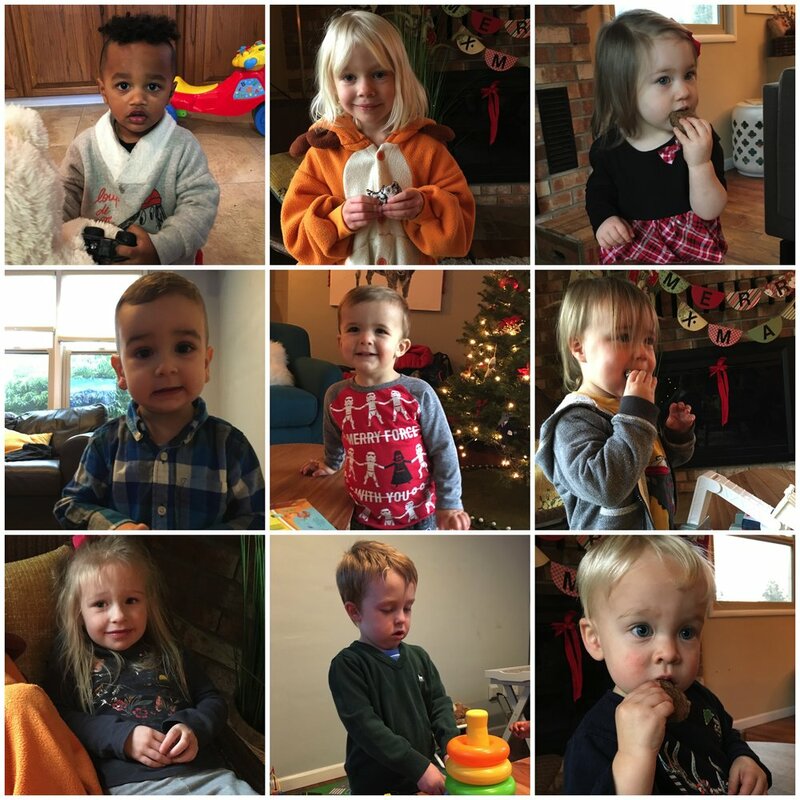 This year we got to experience the terrible twos with Caleb. Which, strangely enough, ended up not being too terrible. Oh sure, there are days where he may have been difficult, but that’s life raising a kid. Right? Caleb is full of personality and he makes us smile everyday. Our hearts melt when he tells us, “I love you,” or hands us a dandelion. He is such a smiley, happy kid and we feel so blessed. 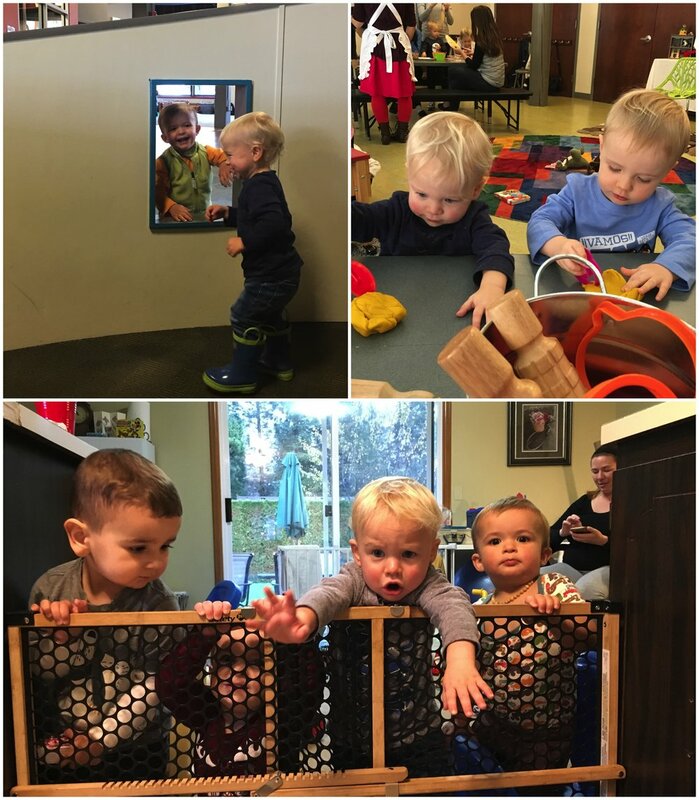 This year Caleb started beginner’s preschool at First Presbyterian Preschool here in Tacoma. He had no trouble transitioning to the school life. He ran right into the classroom the first day and had enjoyed school ever since. Mom enjoys the break two times a week for about three hours. One of our favorite moments was the school’s Christmas concert where Caleb’s class got to sing. In our opinon, Caleb was the star of the show (watch it here). Beyond school, Caleb’s biggest development this year has been talking. He talks in full sentences now, although some of them are in a yoda-like in structure. 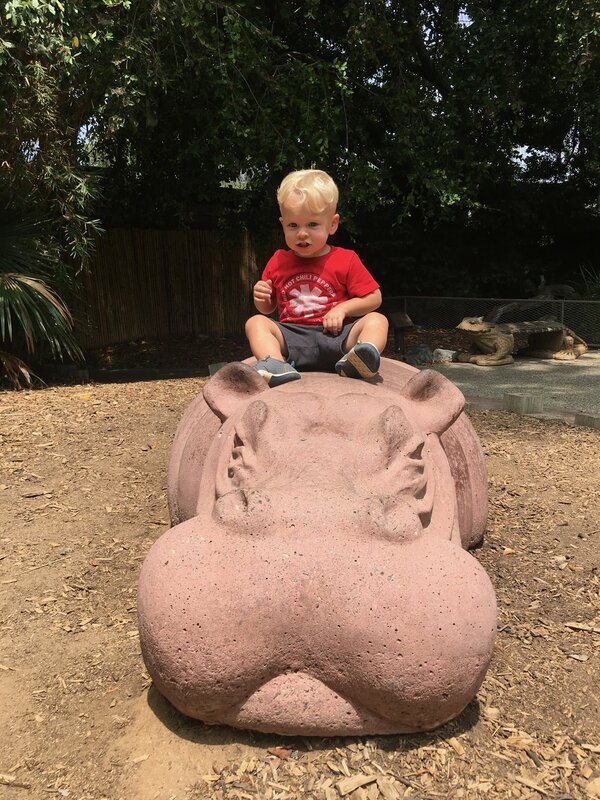 When he’s not talking up a storm his favorite pastimes are running, jumping, riding his bike, and climbing especially with his friends. 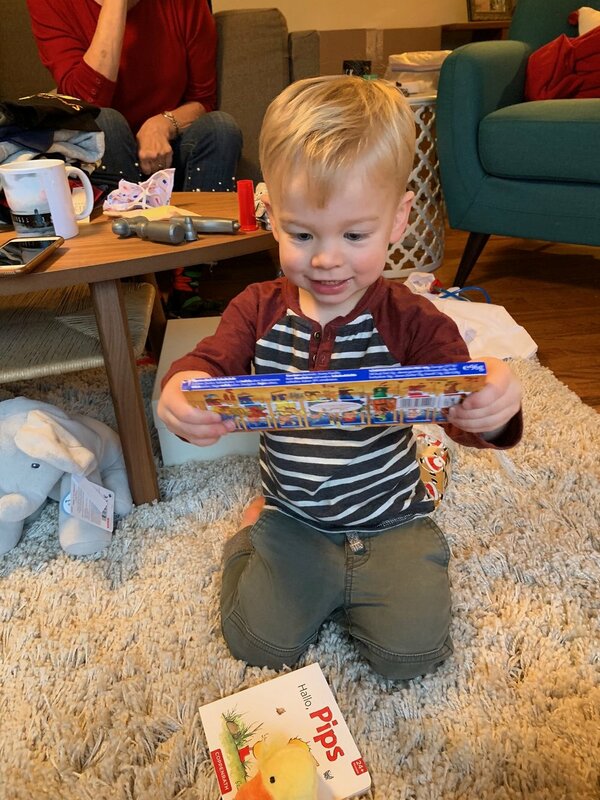 This coming year will be fun as he turns three on January 2nd! Our pup is now four years old! Although, she still acts like a puppy (she’ll forever have the nickname, “Asha Pup” with us). She is so great with the kids for which we are so thankful. She still enjoys her walks and chuck-it sessions at the field. But most of all, she enjoys just being around the family. We had some pretty special trips and awesome visitors this year. 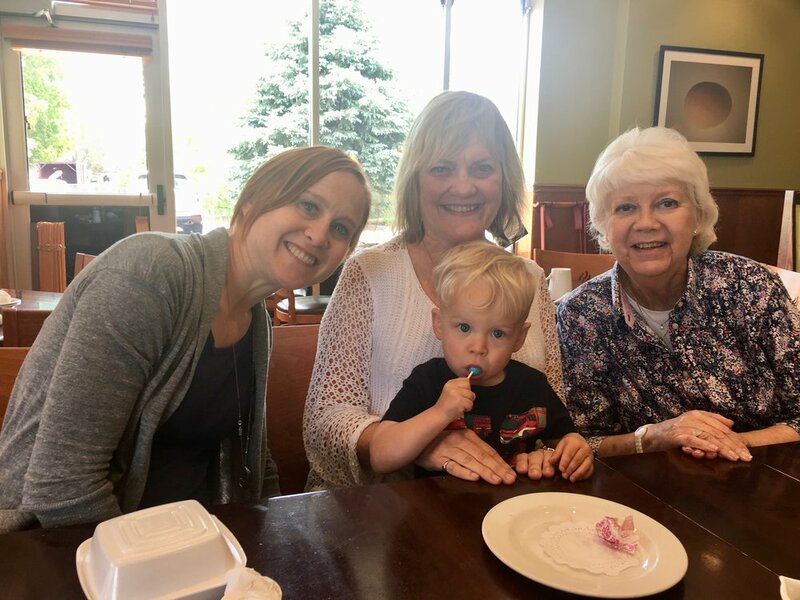 Caleb loves his time with both sets of grandparents, and we got to spend some quality time with both this year. 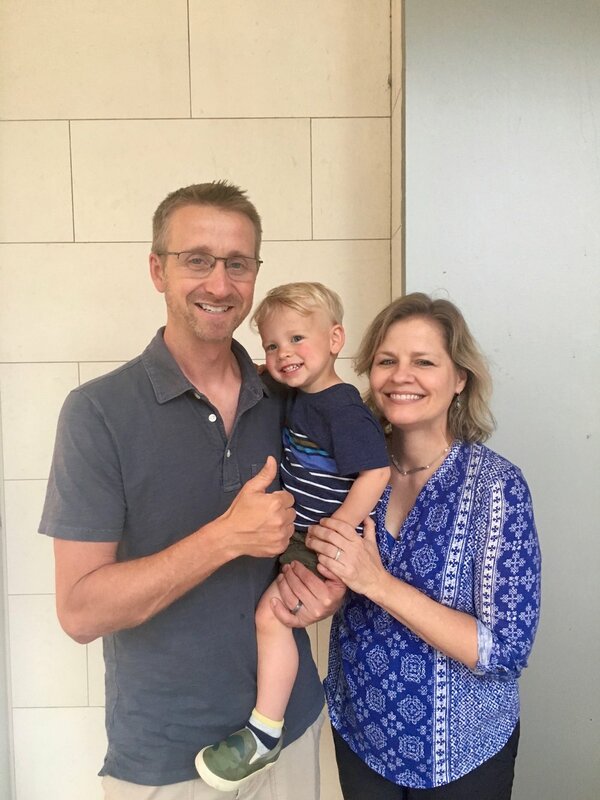 In March, Caleb and I (Heather) enjoyed a week in San Marcos with the O’Neill grandparents. Not only do we love getting time with the grandparents, but the weather isn’t too shabby either. We visited a second time in August (check out more about the August trip here). In April, the Brown grandparents visited us here in Tacoma. 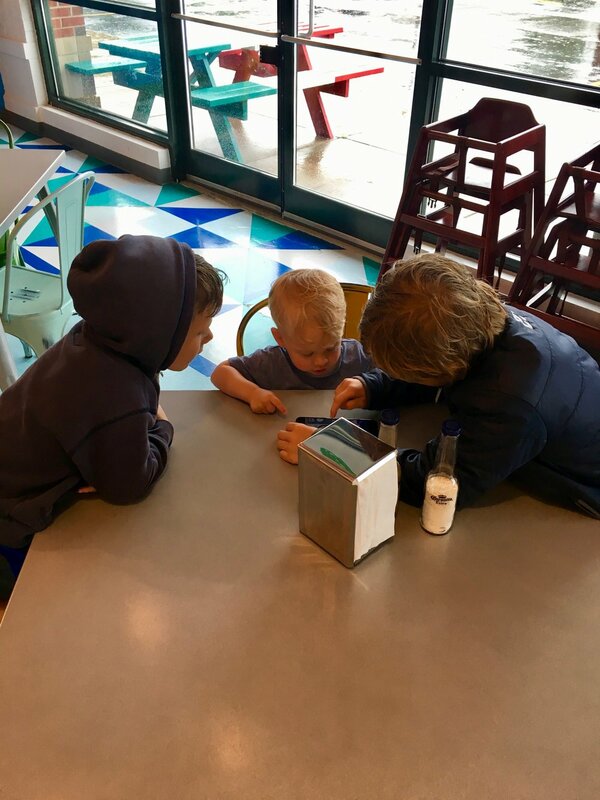 We shared some of our favorite places with them and spent some great time playing together. In addition to the big trips above, we also had some of our own little adventures around the PNW and some nice visits from friends. We really take joy in exploring our little corner of the country. Josh continues to work for the Washington State Nurses Association. He was brought on full-time last year as Director of Digital Transformation and Membership after having them as a client with his former employer. The office is in Tukwila, so luckily he doesn’t have to commute all the way up to Seattle. 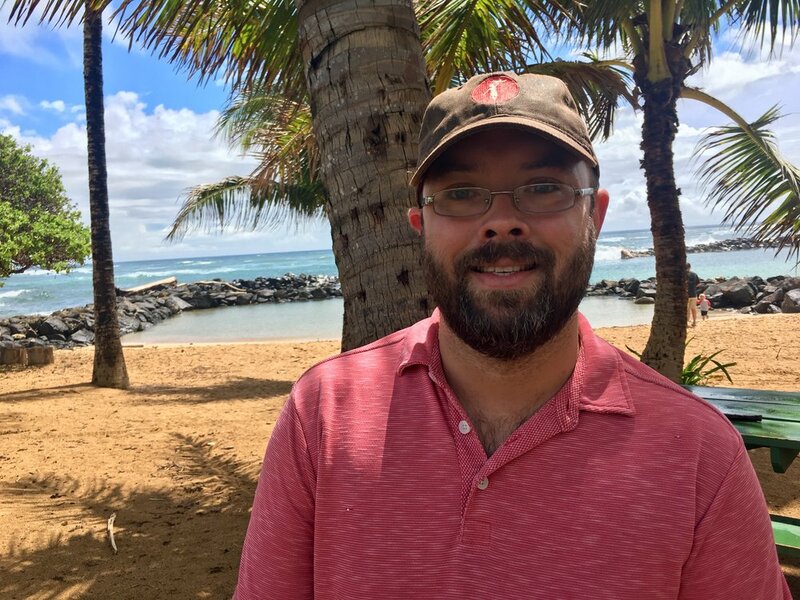 He enjoys mentoring and growing his team and working on new technological capabilities for the association. Our year has been full of merriment and joy. We hope you had a wonderful and memorable year. We love and miss you all. Josh, Caleb, and I are proud to introduce you to our newest addition to the family, Wesley Jackson Brown. 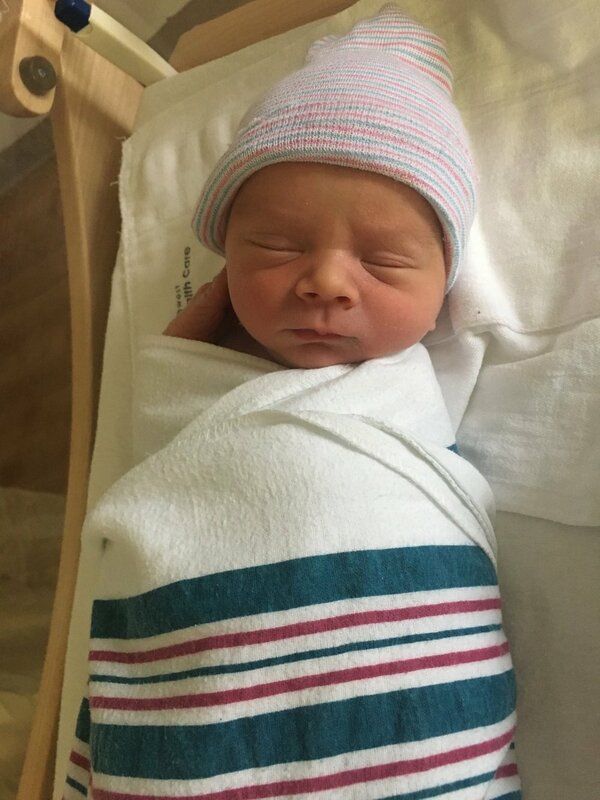 Wesley was born on Friday, December 7th, 2018 at 3:31pm. 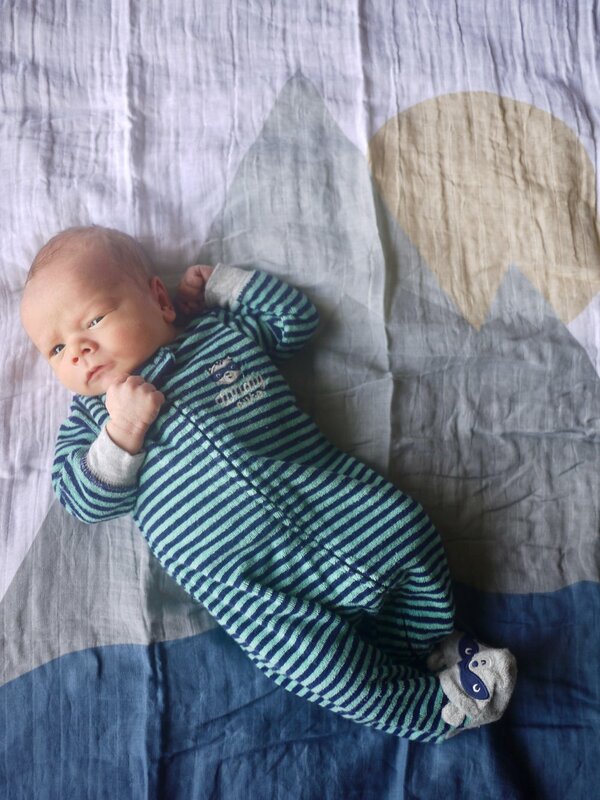 He came into the world weighing 6 pounds, 10 ounces and at 19 inches tall. 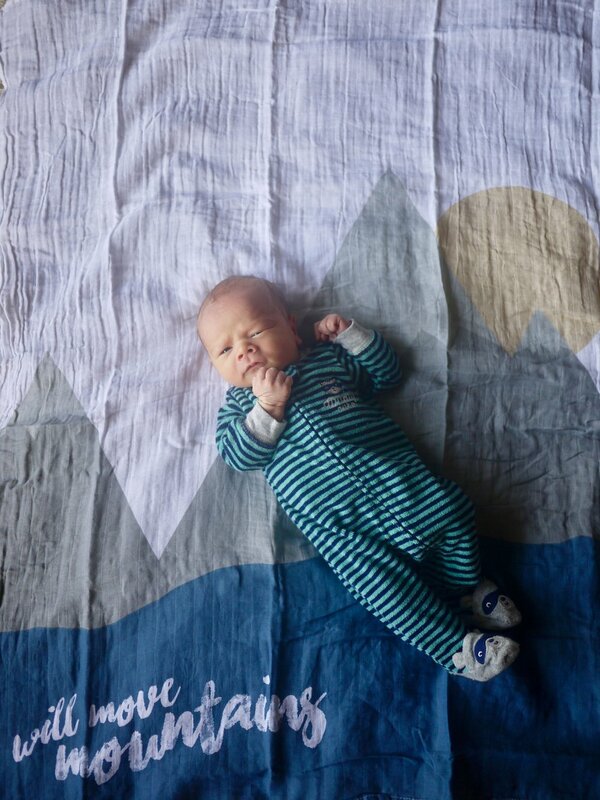 We couldn’t be happier to have this new, sweet bundle of joy. 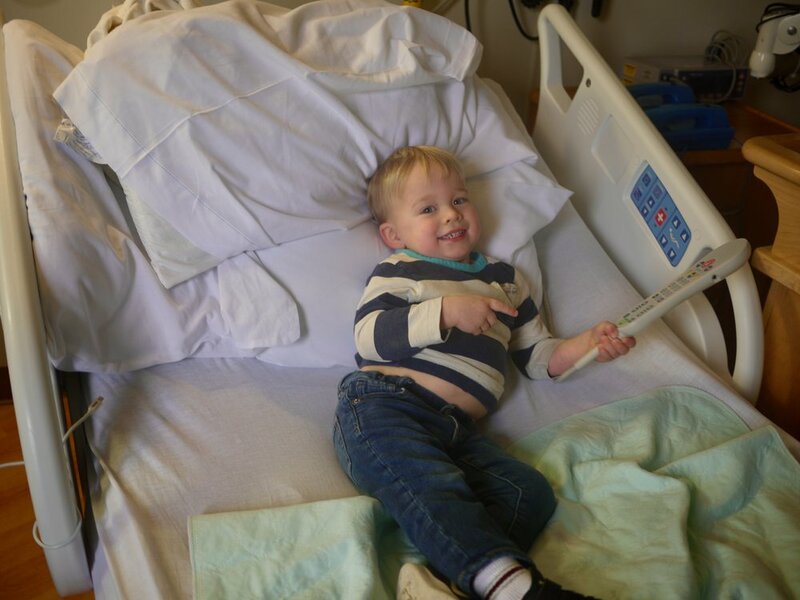 Wesley is already showing his individuality from his brother by arriving past his due date as opposed to over two weeks early like his big brother. In fact, I had to be induced! I’m going to write the whole story sometime soon, but for now I wanted to share some the moments we’ve had so far with Wesley. Wesley was delivered at Saint Joseph Hospital in Tacoma, WA. I was nearing 41 weeks, so he ended up having to be induced. Once things got rolling, he came quickly and naturally. 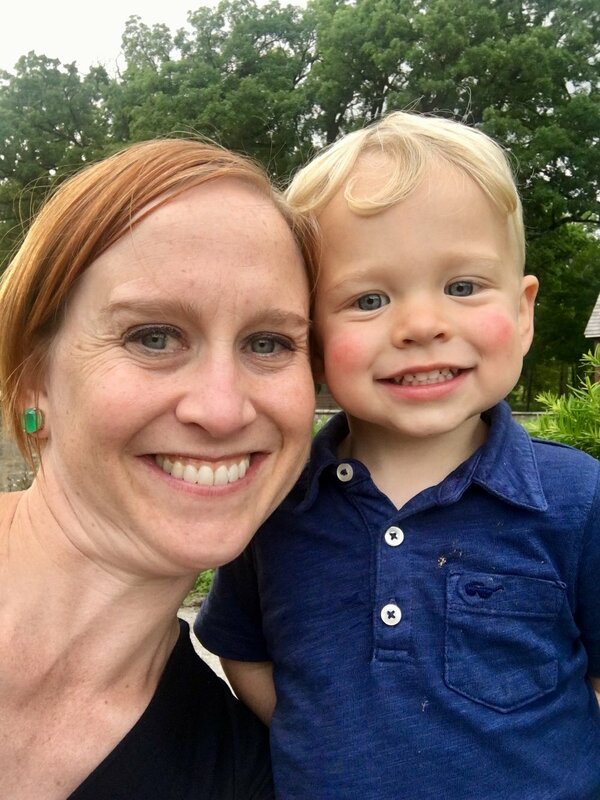 More on that story later as I need to write it all up and I didn’t want to wait to get some photos out to you all because Wesley is too cute not to share immediately (or at least, that’s what his mama thinks). Caleb got to meet his new brother on Saturday morning, the day after his brother was born. He was super sweet with Wesley - patting his head, looking down at him. It was all very new to him, but he did a great job and made his mom and dad proud. But I think what he liked the best was when his baby brother gifted a totally rad astronaut helmet. Caleb wore that all the way out the hospital after his first visit. We came home from the hospital on Saturday, 12/8 evening. I wasn’t as scared driving in the car with an infant this time. Funny how the second time around you’re a bit more confident. We put Wesley down and Asha sniffed him, and then went to her mat to sleep. I think she is thinking, “oh man, another one!” But she’s so good with the kids. Caleb was at our friend’s house and came home and ran up to Wesley and just looked at him with a sweet smile. Having a second baby is definitely different than your first. With your first you take weeks to get out of the house, with the second you’re out of the house the next day practically (well, maybe the second or third). Our first outing was for Caleb’s preschool Christmas Concert, which I’m so glad we got to attend because Caleb was the biggest ham and the cutest performer. (Watch his performance here). 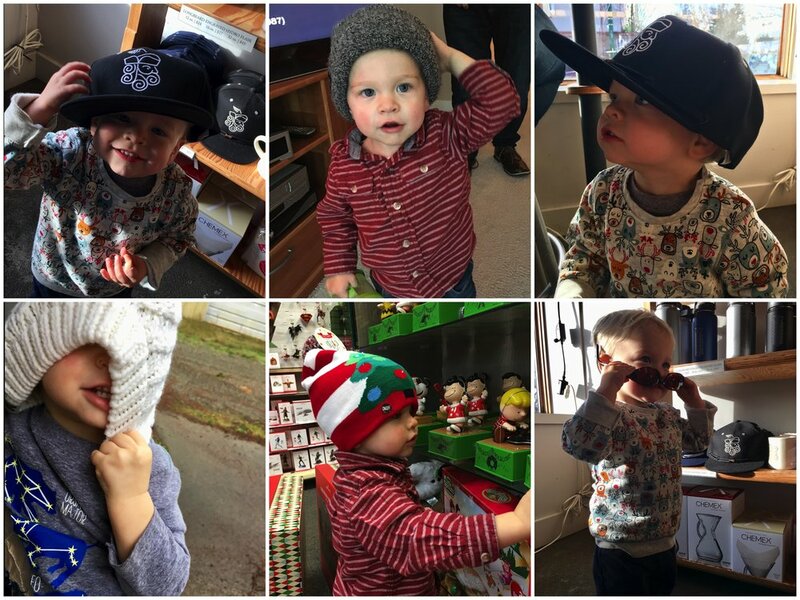 Over the course of our first ten days home, we’ve done some small adventures out like the grocery store, the farmer’s market, the toy store, a bakery, the bookstore, and seeing Santa. Wesley is a trooper with it all and is nursing on-the-go with me. This is big for me since it was so hard for me to nurse outside the house with Caleb. 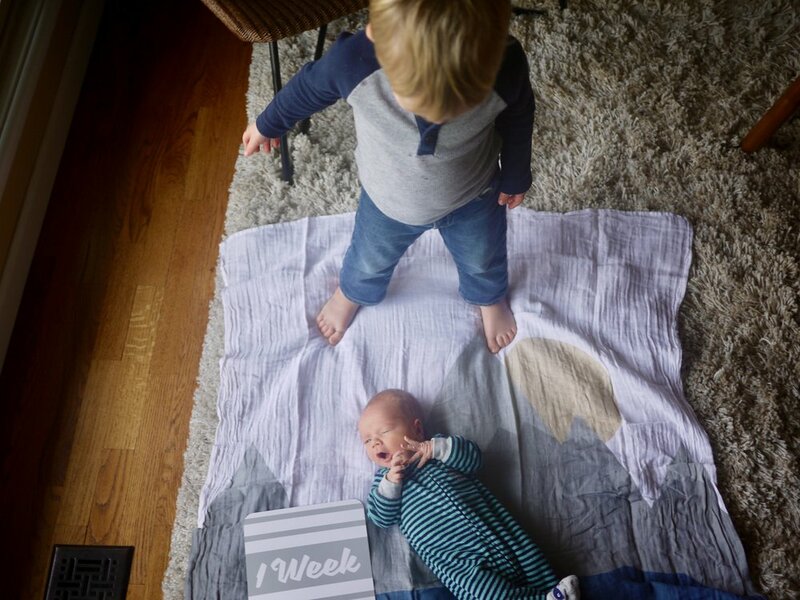 Caleb is already proving to be an awesome big brother. He loves to pat the “tiny baby” or his “baby brother” (as he says) on his head and give him kisses. He wants to help mom and dad with the baby and checks that “baby comes, too?” when we go out. He says cute things like, “baby blue eyes, Caleb blue eyes, mommy blue eyes, daddy blue eyes.” Or, “baby tiny lips, me big lips.” Then just last night he did the “kiss monster” (something mom and dad to do to him - basically it’s just showering someone with lots of kisses) to his brother. Ahh, my heart melts. Watch a video of some of Caleb and Wesley’s interactions. Time is already flying by! 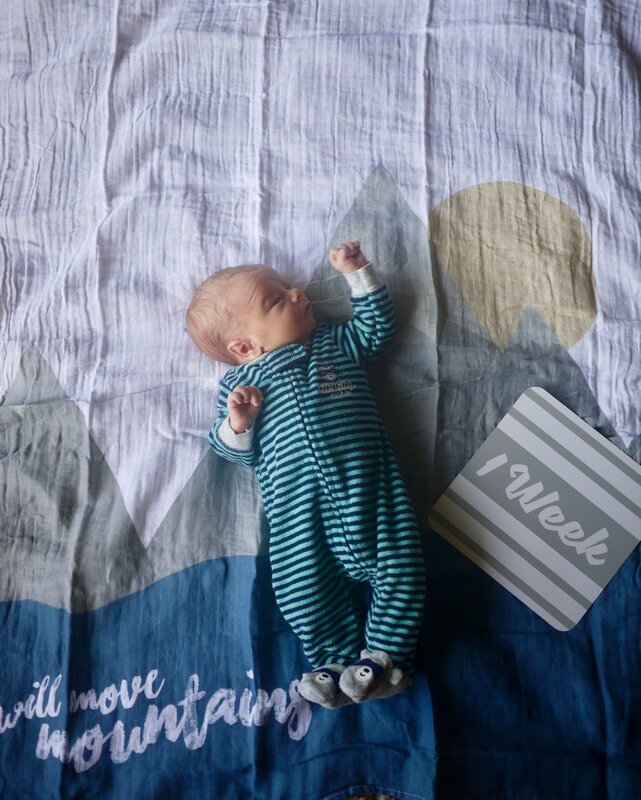 Wesley is now over a week old, but I had to take some one week photos. 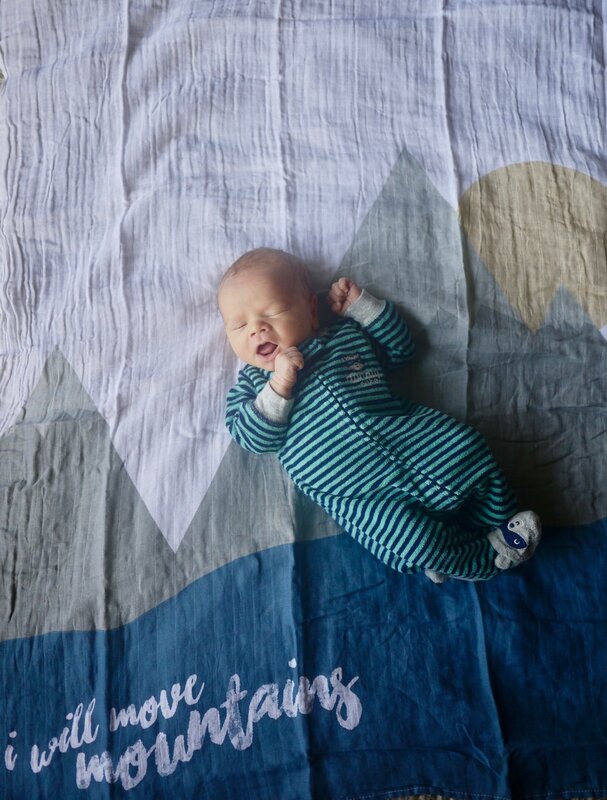 He’s definitely going to move some mountains. I hope to continue to share more about Wesley and our life as a new family of four. Also, I post a ton of photos on Instagram if you need a Wesley and Caleb fix. Love you to you all! At the end of September we had the most wonderful opportunity to visit the Brown grandparents in Kauai. They are living it up there for the year and we just had to join in on the fun. 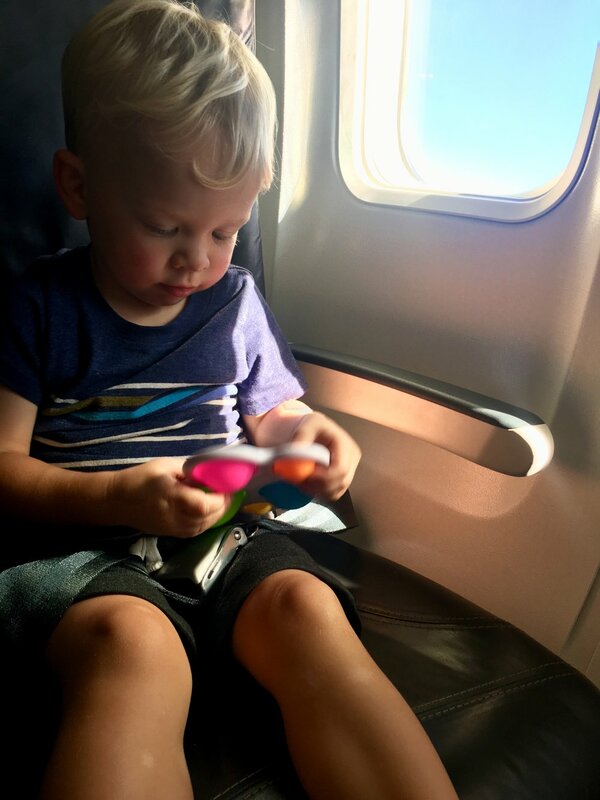 We took up every parent’s worst nightmare (or one of them anyways) and took an almost six hour flight with a toddler and the mama being 30 weeks pregnant. Caleb went the longest span of time ever being awake as the little sneaker didn’t want to nap on the plane. The return flight Caleb had croup and was terrible until he finally fell asleep for a good nap. We survived and it was all very much worth it because we are left with precious, sweet memories of our time there with Mimi Nada and Papa Don. 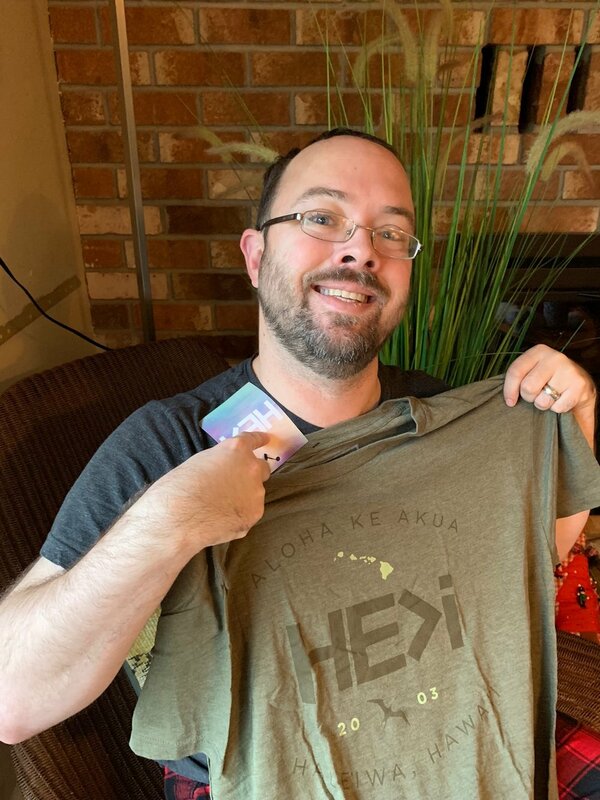 You don’t go to Kauai to sit inside. The fun is outside especially at the beach. Caleb found his own little heaven at the beach. There was sand to play and run in, water to boogie board and splash in, and “crabbies” in the sand. 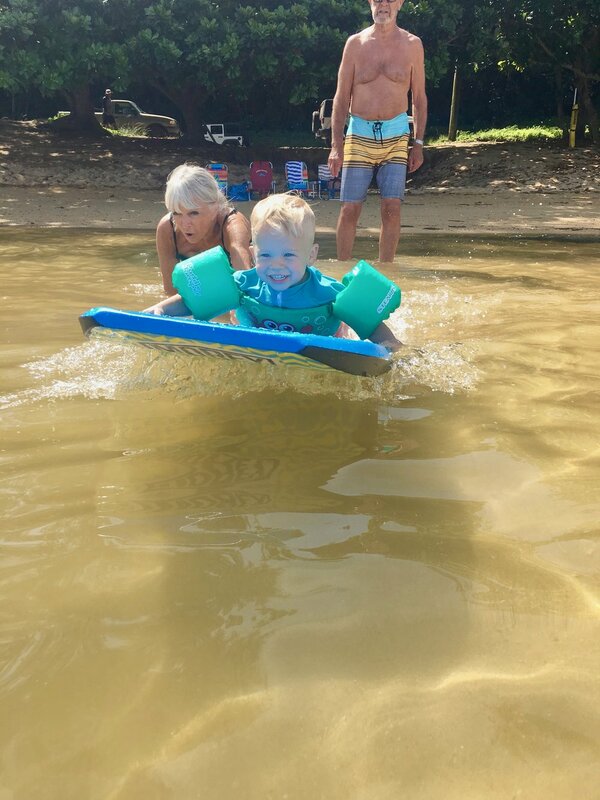 I’m pretty sure if we stayed longer, Caleb would have basically learned to surf. Another highlight of the trip was the train ride at the Plantation Railway at Kilohana. 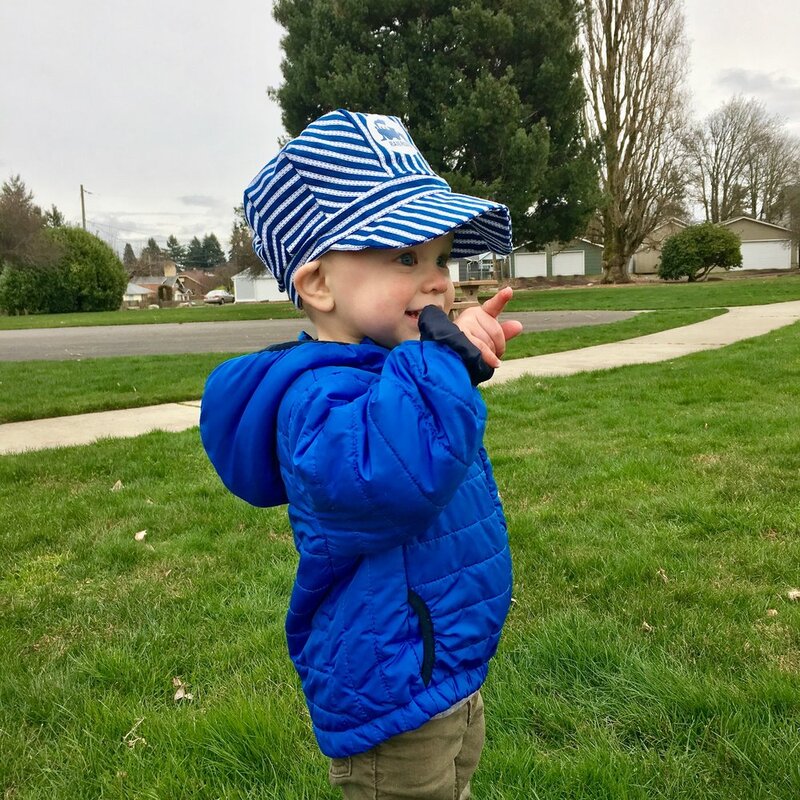 Caleb has a love for trains, so this was quite the thrill for him. Not to mention, a stop halfway through to feed the pigs. The Train Engine, Whoo Whoo! We enjoyed two nights at the the Grand Hyatt Kauai Resort down in Poipu and had a complete blast. The best part: the pool. The pool there is absolutely amazing and we really loved the lagoon-style pool and floating around in the inflatable tube. We also enjoyed a memorable and delicious meal at Tidepools to celebrate Don’s birthday. 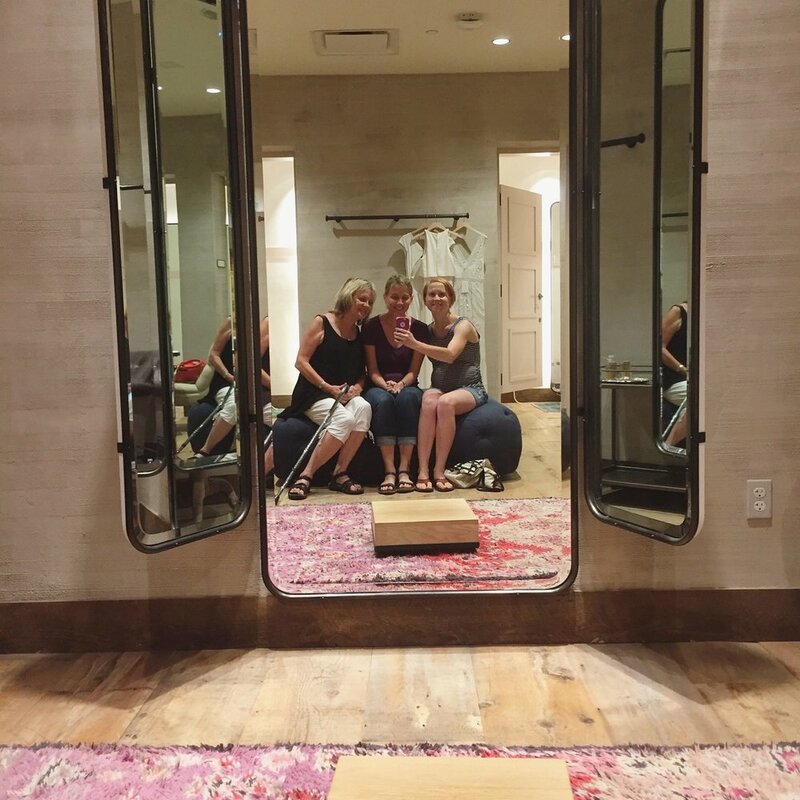 We felt so honored to get to spend time here at this beautiful resort. It was so humid the morning we went to the lighthouse, but we still enjoyed the tour into the lighthouse even though we had to bow out early given a noisy toddler and a nearly fainting preggo mom. But the views were gorgeous! 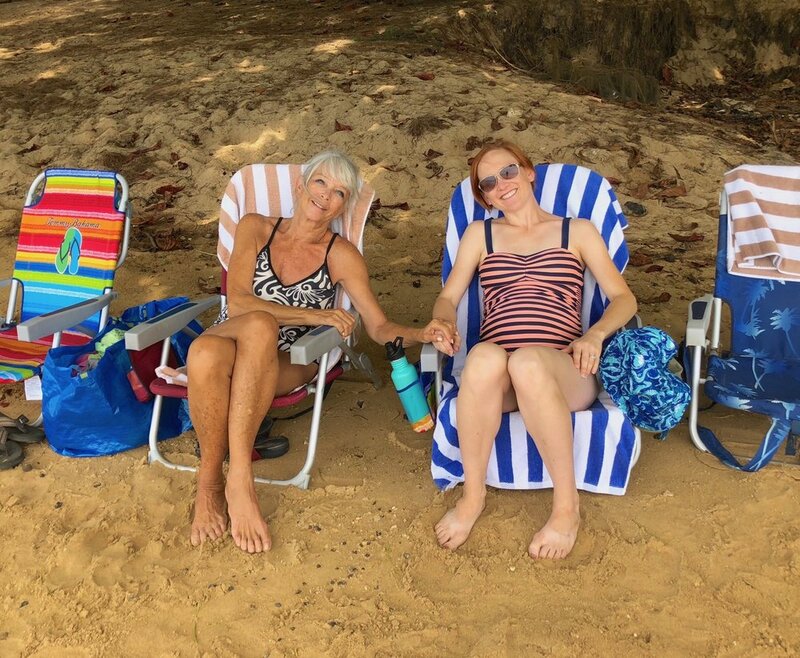 The beauty of the island cannot be described, but the family time is where it’s really at. It’s the best part of the trip, in fact. We had some awesome times just hanging out with Mimi & Papa and each other for the week. Food was consumed, of course. 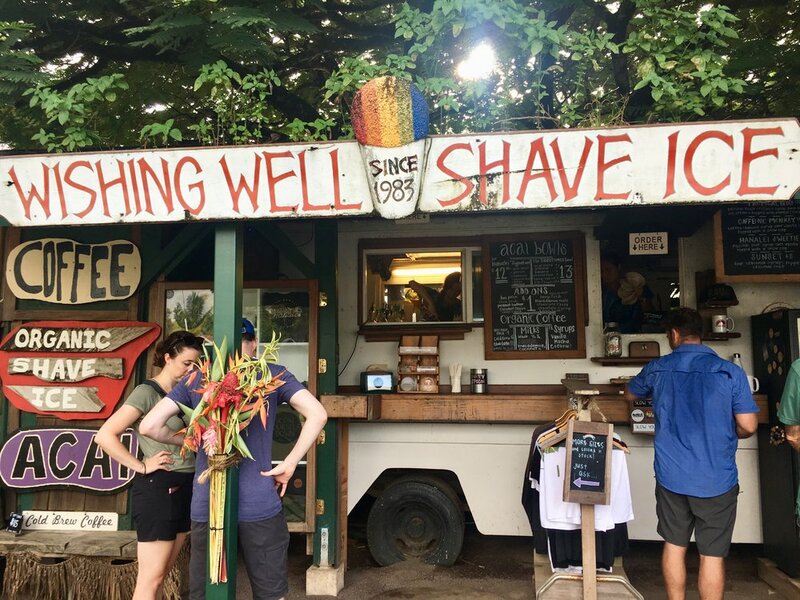 Some favorites were the shaved ice, juice and kombucha, coffee, and donuts. Not pictured were some delicious hamburgers and pizza and the best meal of all was at Tidepools at the Grand Hyatt to celebrate Don’s birthday. 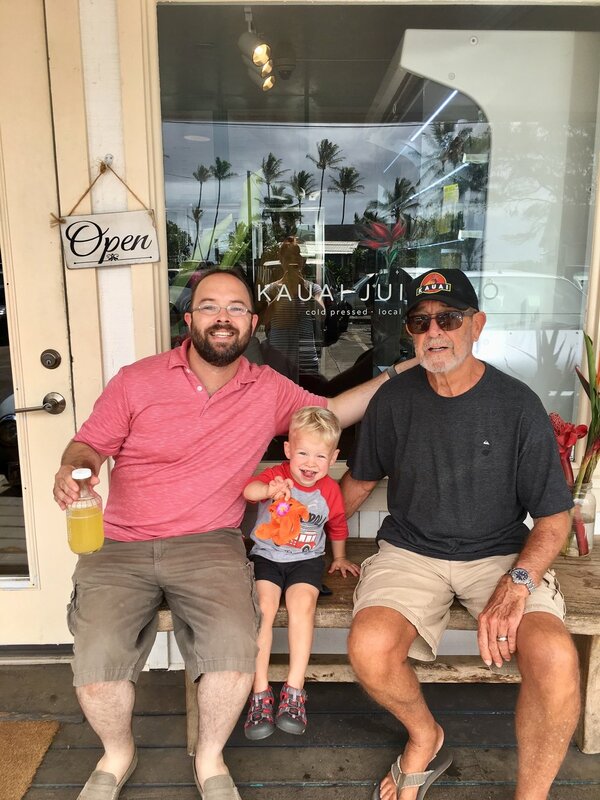 Refreshments at Kauai Juice Co.
What an amazing trip!! We are so blessed we had the opportunity to take this trip and make great memories. 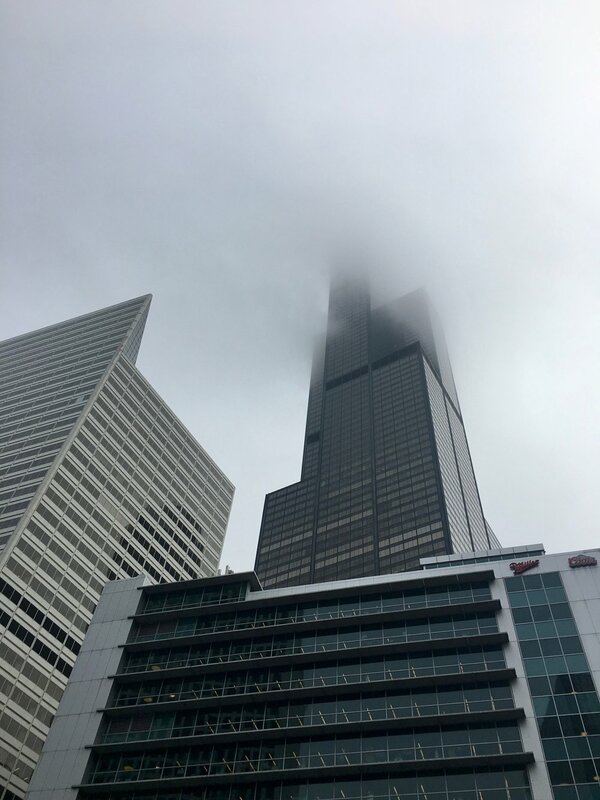 Last week we got the chance to go to Chicago for my cousin's wedding and to visit family. 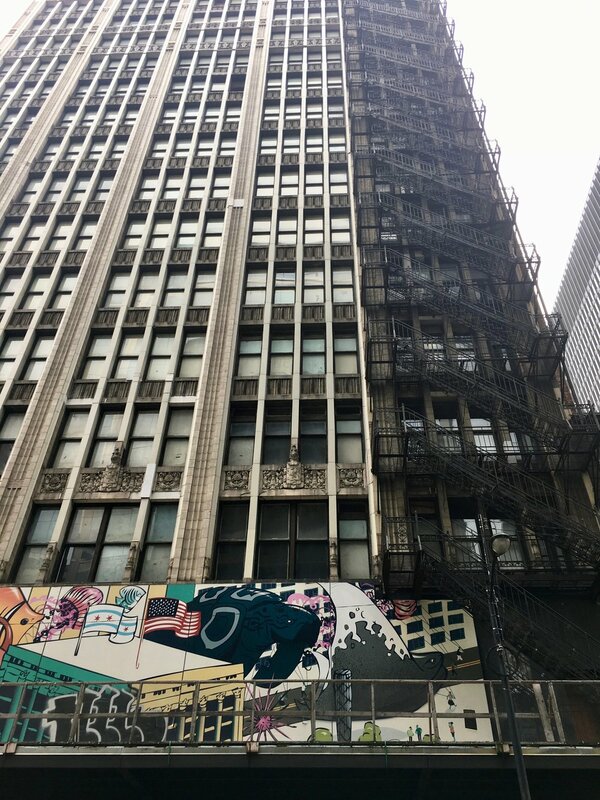 We also snuck in some time exploring downtown Chicago. We had a great trip and I was wonderful to introduce Caleb to my family and to a very cool city. Here's a few snapshots (okay, a lot of snapshots) from the visit. I'll let the photos do most of the talking. As you can see my Uncle Chuck loves trains. 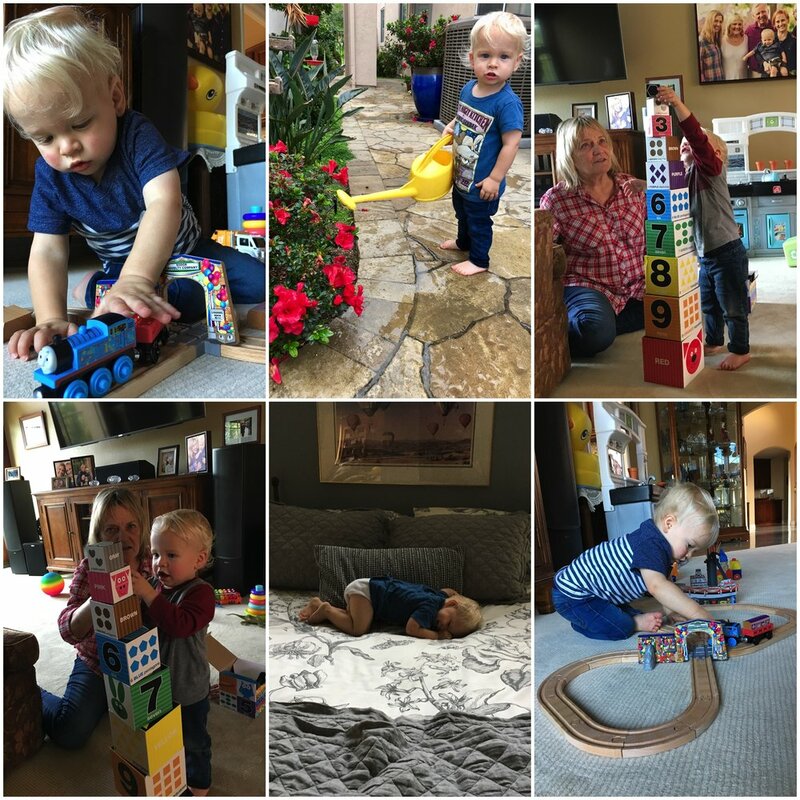 He's got quite the setup in his house and we got to see the trains go choo-choo (video!). Caleb is throuoghly obsessed with trains now. We also enjoyed a lovely brunch with the Merkner crew. 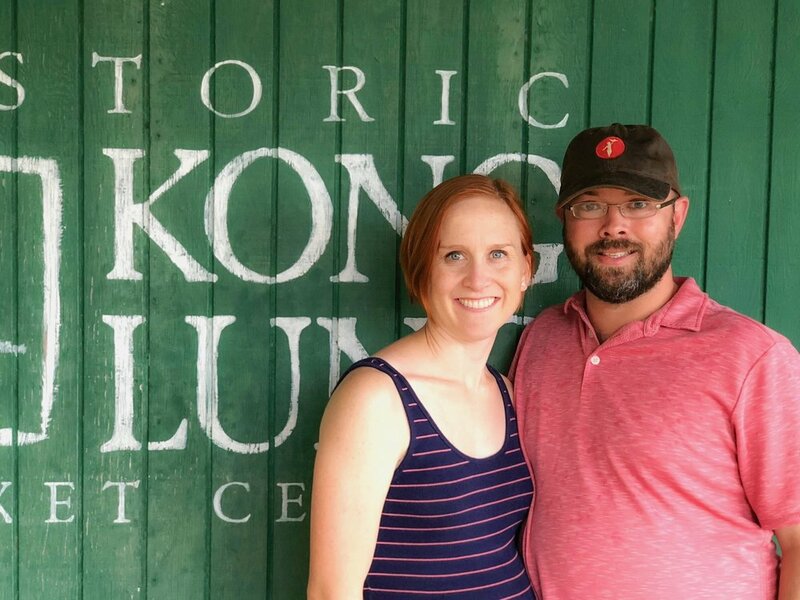 We were invited to the rehearsal dinner, which was great since we got to play some mini-golf. Caleb's first time and Grandpa John was proud to teach him how to golf. The wedding was beautiful and took place on a lake. The weather was perfect and we all enjoyed ourselves immensely. My cousin Erin hosted an awesome family BBQ on Sunday afternoon. All the aunts, uncles, cousins, and little cousins (technically 2nd cousins, I think) got to hang out and catch up. Caleb had A BLAST with all his little cousins. 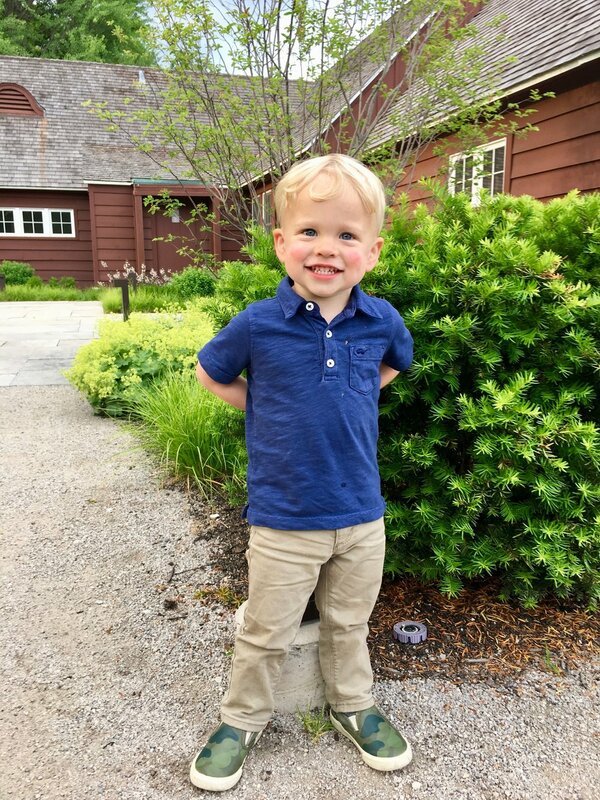 We got to spend one morning at the Morton Arboretum with my cousin Erin's boys, Ethan and Henry. 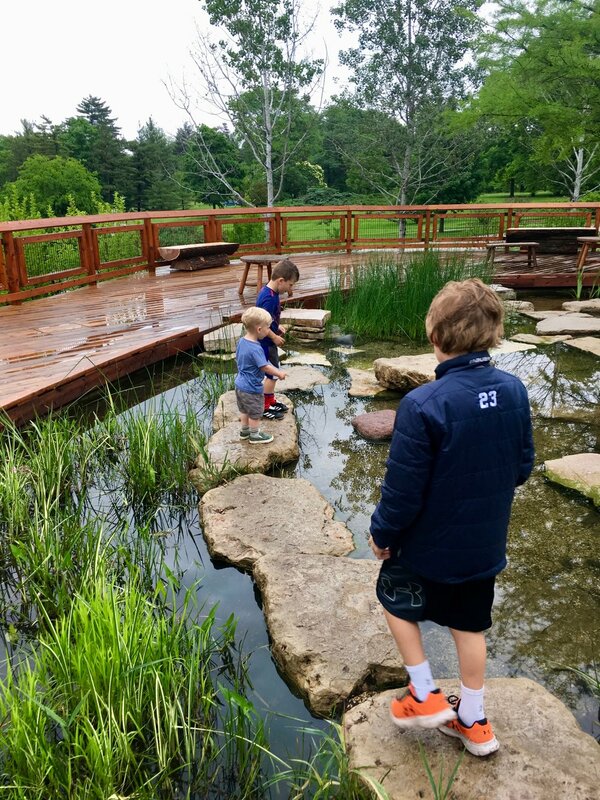 This arboretum was so cool and the kids had some much fun even though it rained! Grandma Ruth would be pleased as punch to see that we took Caleb to Navy Pier. We didn't go on the "world's tallest ferris wheel" (so says Grandma Ruth), but we did to remote control boats and the merry-go-round. As you can see, Caleb was pooped by the end of the day. 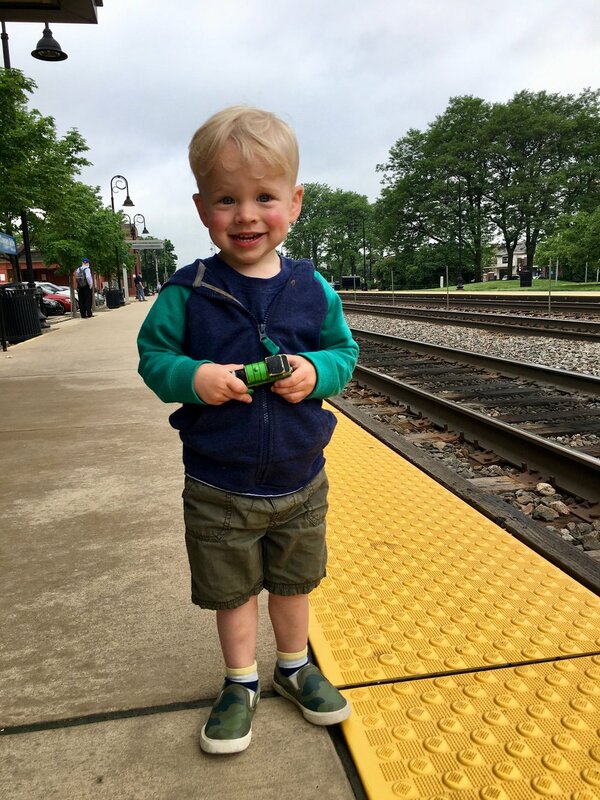 Caleb had his first train ride from Downers Grove to downtown Chicago (video!). He thought it was the coolest thing ever. 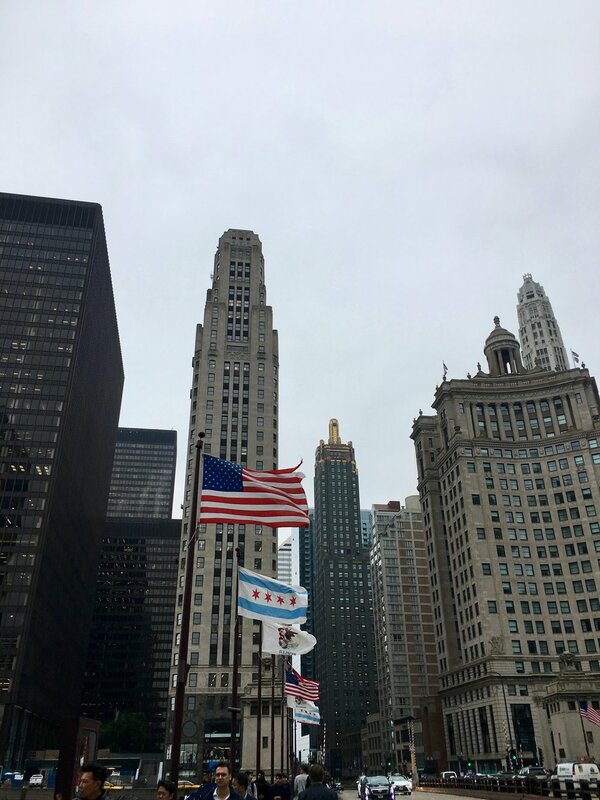 Then we grabbed coffee and breakfast and walked to Millennium Park. We ran around Maggie Daley Park, walked by the bean, and then enjoyed lunch at Rick Bayless' Frontera Grill. 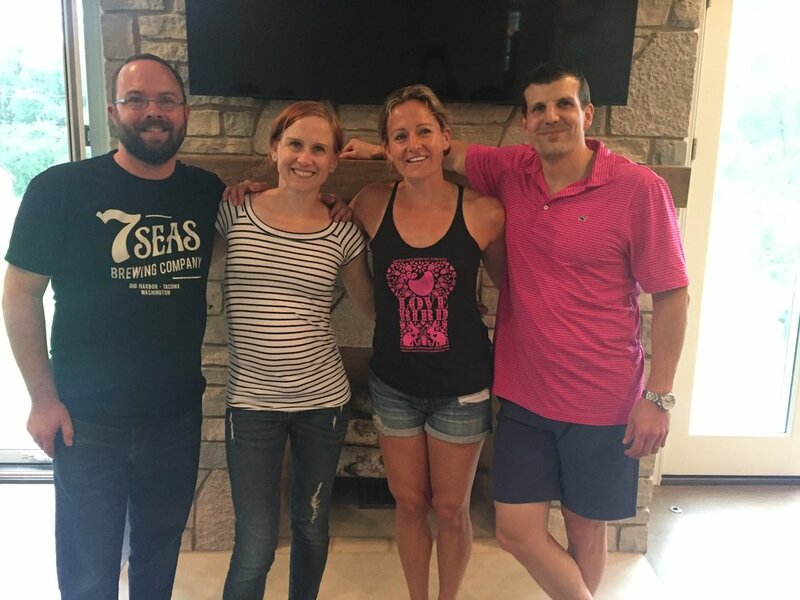 We stayed at a trendy Home Away (similar to AirBnB) in Downers Grove, which is near my cousin Erin's house. 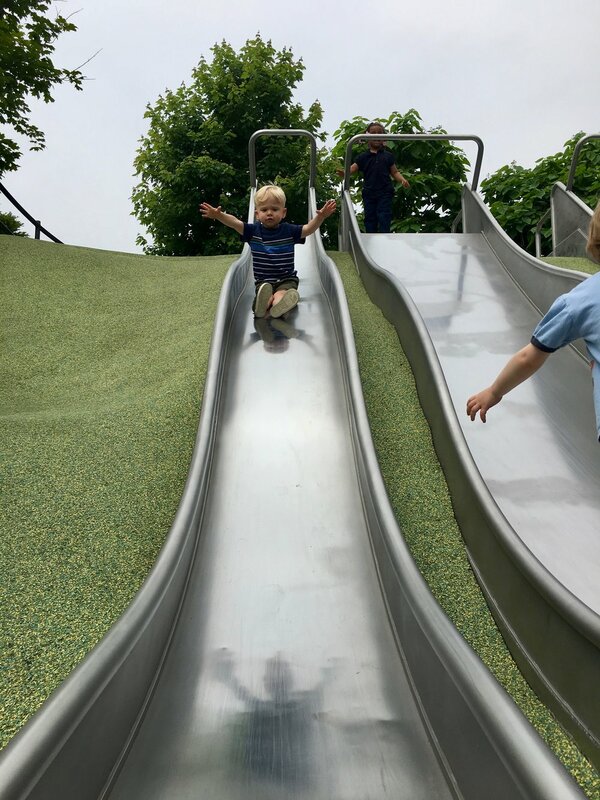 There were some great parks to play in and we also checked out the Saturday Farmer's Market. And the flights...well, we survived. You are reading that title correctly. 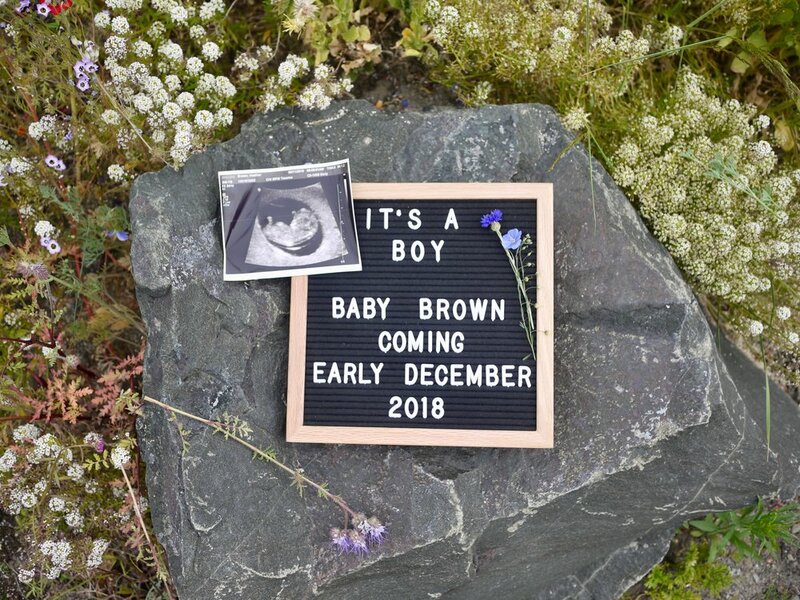 Soon there will be FOUR Browns in this family. Josh, Heather, Caleb, and....another little boy! 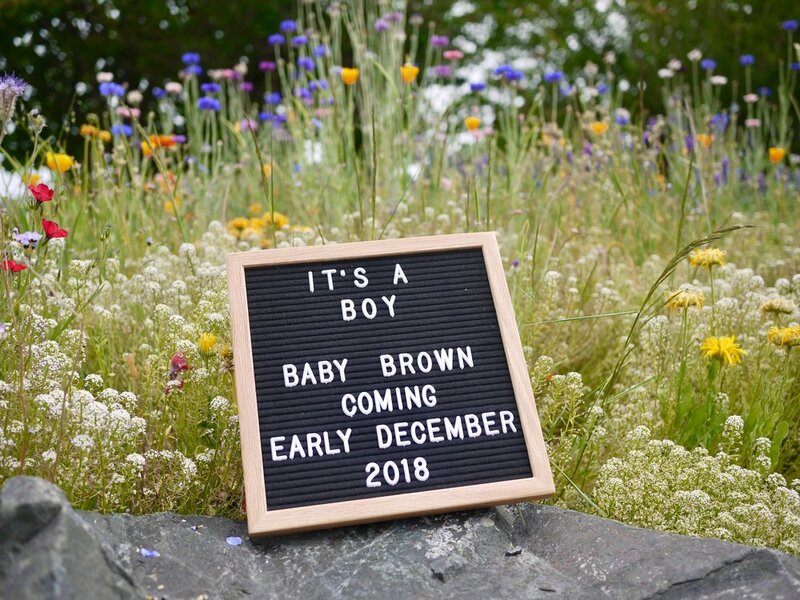 Baby Boy Brown #2 is expected sometime late November or early December -- official due date is December 2nd, 2018 (we'll see!). It seems not so long ago we were announcing my first pregnancy and birth of Caleb. Now, we're adding another to our family crew. We're all very excited and can't wait to meet this little guy. I'll try to keep you in the loop as the year progresses! Have you missed the monthly Caleb updates? I have, but I'm his mom and I love anything that involves Caleb. It's a mom thing. May I also say, how has it been four and half months since I wrote one of these posts? I totally intended to do it quarterly, but somehow that slipped. 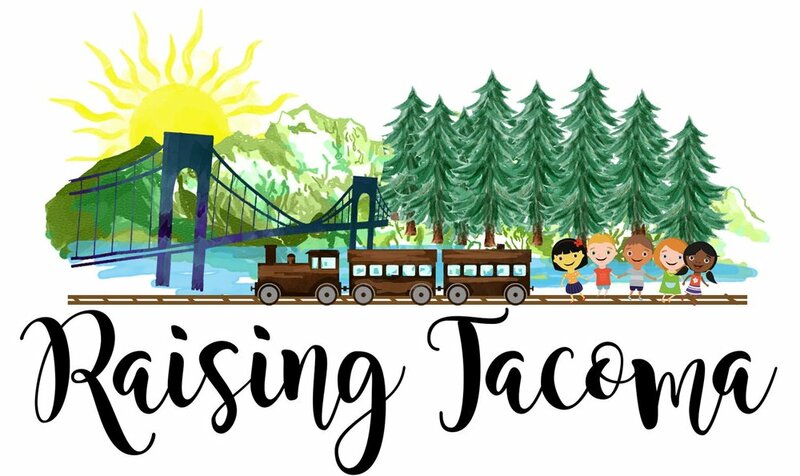 But, have you been to my lastly blog adventure, Raising Tacoma? I'm trying hard to post weekly there. Plus, if it's Caleb photos you're looking for, he's the star of that blog basically. Caleb has grown and developed a bunch since my last post. Doesn't he look like a little man now? To keep up with his constant growing, I do two things: (1) I write little notes throughout the month on my "notes" app about things he is doing hence the bullets you see here. Then (2) I got thorugh periodically and pick my favorite photos and save them to a "CAB Favs" album in my Photos. Hopefully I appreciate all this effort sometime. Actually, I already am in a way! Shaking hands with people. If Josh and/or I shake someones hand, he needs to shake it as well. When being scolded, he starts kissing my face all over. Ahhh, how can you stay mad/stern???!!! Jumping off and climbing everything. This scares mom everytime; he's taken some big tumbles. He's definitely better at both, though. Foods: Taken to liking his mom’s granola. Came running out naked into the kitchen for me, brought me into the bathroom, & show he’d peed. I think potty training will happen soon. Double feet jumping - oh boy! Jump over and off everything. Food of any kind and water is called "Nom Noms"
Holding onto gummy vitamins, yogurt raisins, m&ms (little foods) in hand for ~30+ minutes. Ha! Calls his diaper "bubble" - not sure why??? Fish go "blub blub blub"
Nap was pushed to 1pm (from 12pm) - Terrible 2-year sleep regression! And that's totally on me. I feel so guilty that my personal blog has been so neglected. I have these dreams of getting lots of fun posts up for you, but then life happens and whomp whomp. I'm sure you're curious as to what's keeping me so busy. Well, for starters, everything, but here's a few. This kid has me like whoa. He is so active. 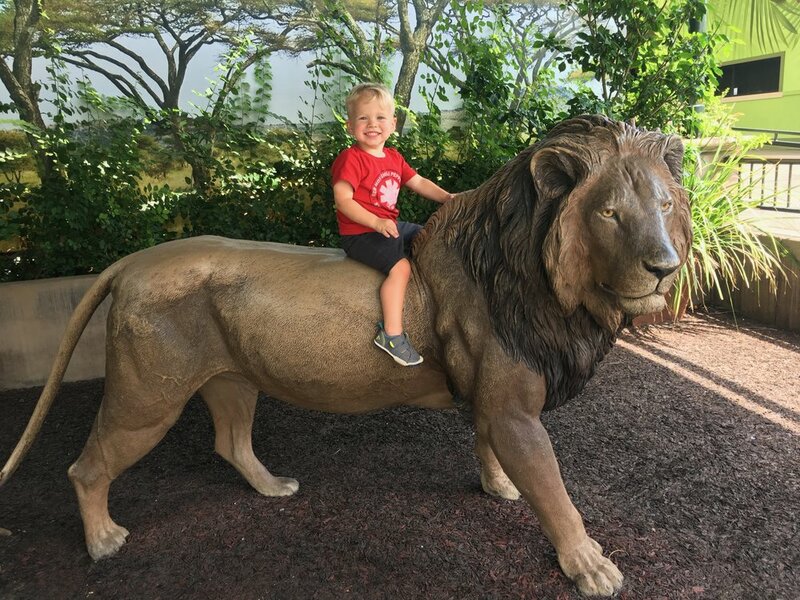 I am that mom chasing her son everywhere - the grocery store, the zoo, the park, the library...anywhere you can run which is everywhere if you ask Caleb. I'm working on getting him to listen to me, bahahaha. He's too cute, though. The cuteness makes up for all of it. Not to mention, I get a good work out. I feel like he's been on and off sick with croup or a cough since February, but I think we're starting to get over it. Gawh, winter and the sick season with toddlers is terrible. I'm so glad for spring and summer on the way. I'll write more about Caleb soon. 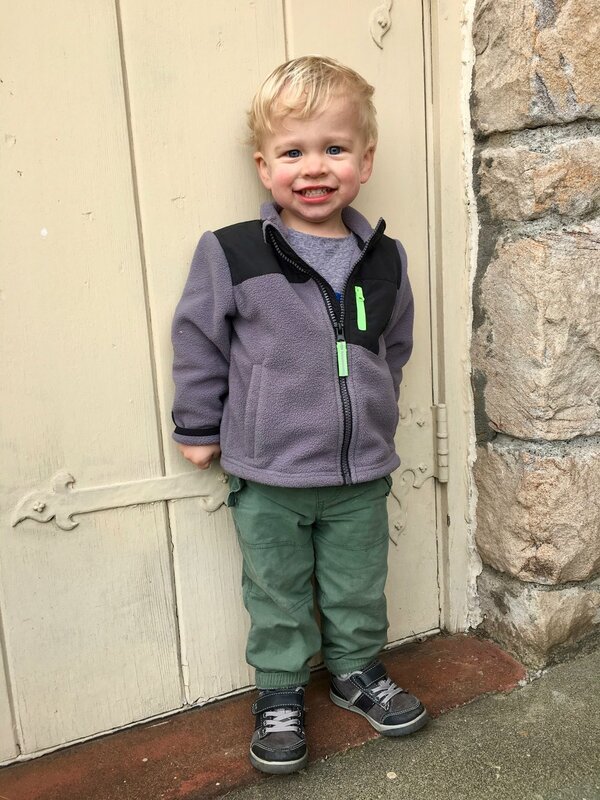 Can you believe he's two and a quarter already? I've started a new blog adventure. It's called Raising Tacoma. Basically it's about raising Caleb up in Tacoma. 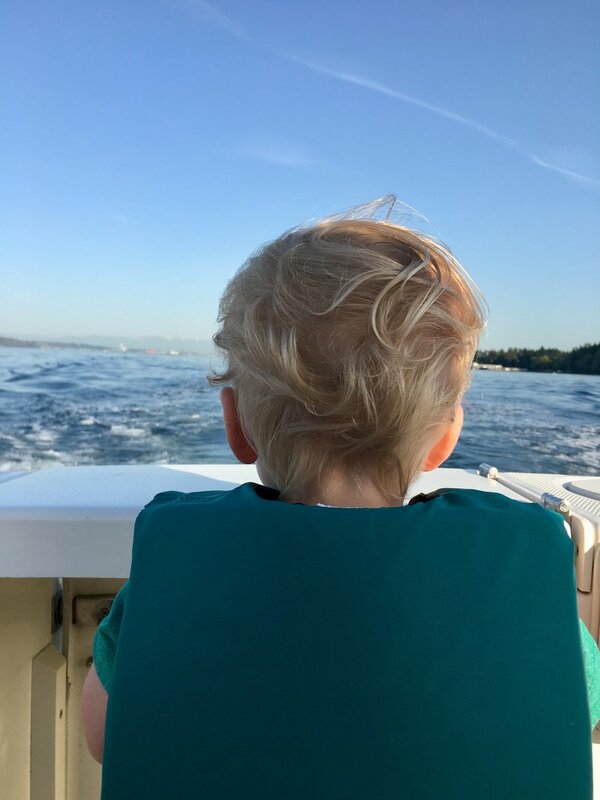 I am trying to write about places we go and things we do in the area, but also more genetic toddler things so if you don't live in Tacoma you still can get something out of it. Maybe someday it'll make money, bahahaha again. But for now I am just looking to create a little space on the web for mom friends to get ideas and connect. So come on...read it, share it, love it! The last weekend in February, Caleb and I flew down to San Diego to visit my parents, aka Grandma Jan and Grandpa John. Caleb was a champ on the flights there and back - best yet! 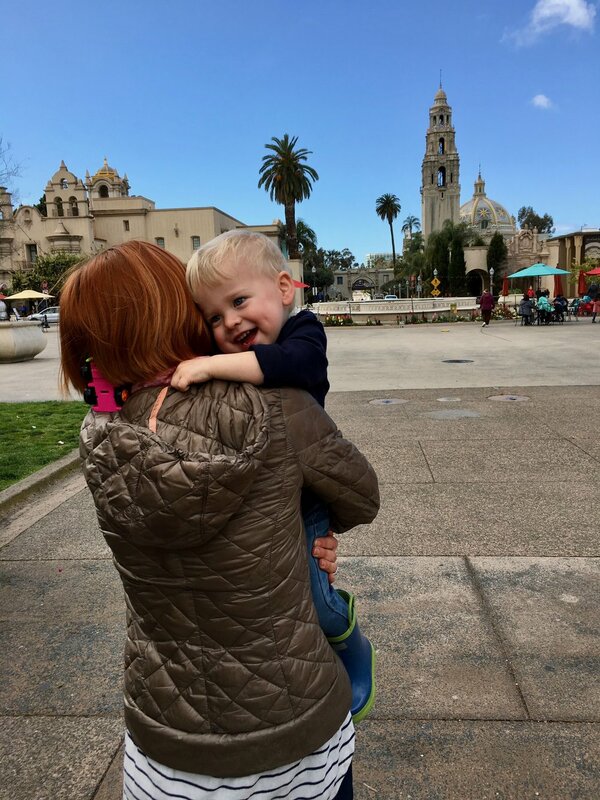 We enjoyed the sunshine, the beach, bubbles at Balboa Park, the Railroad museum, shopping at UTC, visiting Grandpa John's work and just chilling. Easter was pretty low key here. Sadly, Josh caught the stomach bug Easter morning, so Caleb and I went to church together. Then we let dad rest as we walked the park and enjoyed the sun that showed up in the afternoon. He also refused to wear his adorable Easter outing. Apparently collared and buttoned shirts are not a thing right now. We also did an Easter egg hunt at the park down the street. We were joined by our friend, Sebastian. 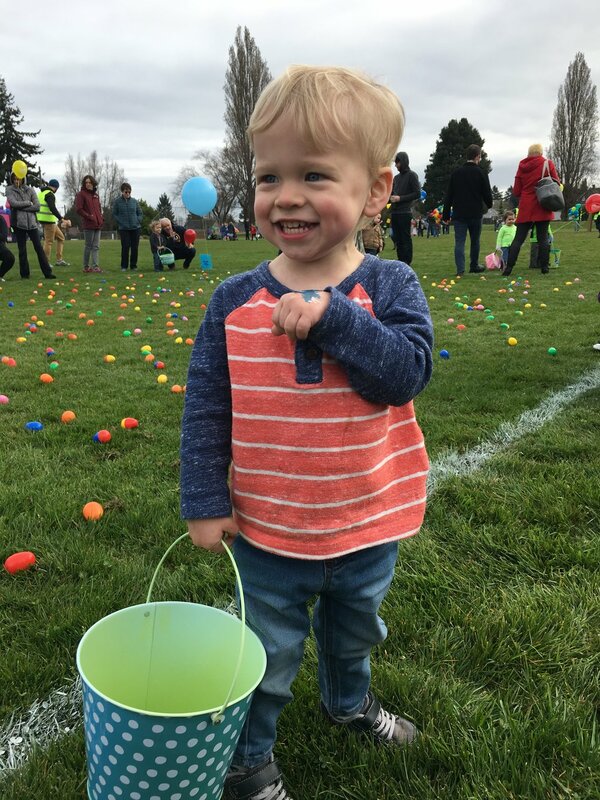 Luckily Caleb didn't realized there was candy inside the eggs until after the hunt was over. Then he was thrilled to discover chocolate inside. I think he would have picked up like two eggs had he known what lie inside. Caleb also discovered temporary tattoos and bouncy houses. Woo Hoo! 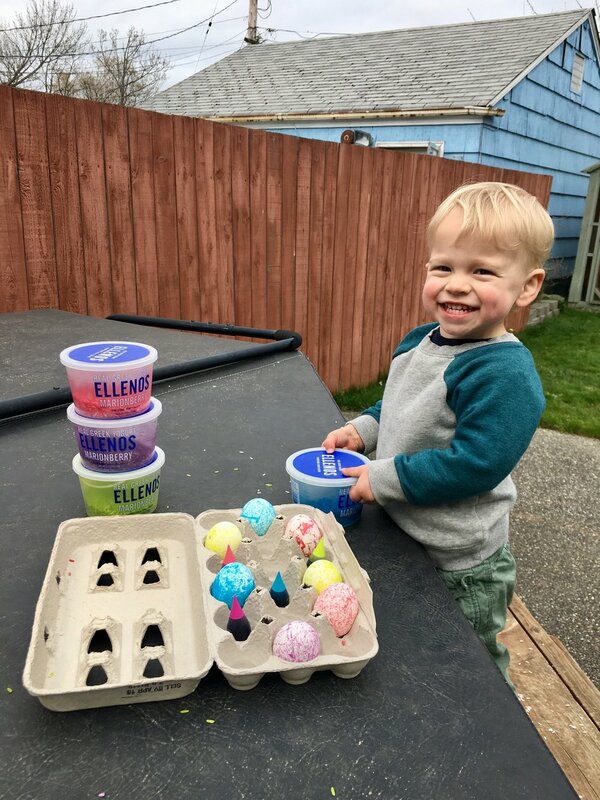 There was also some Easter egg coloring fun, too! Read about how we did it on my Raising Tacoma blog! About two weekends ago Mimi Nada and Papa Don visited us here in Tacoma. Unfotunately there was a ton of rain, but we still managed to have a great time. 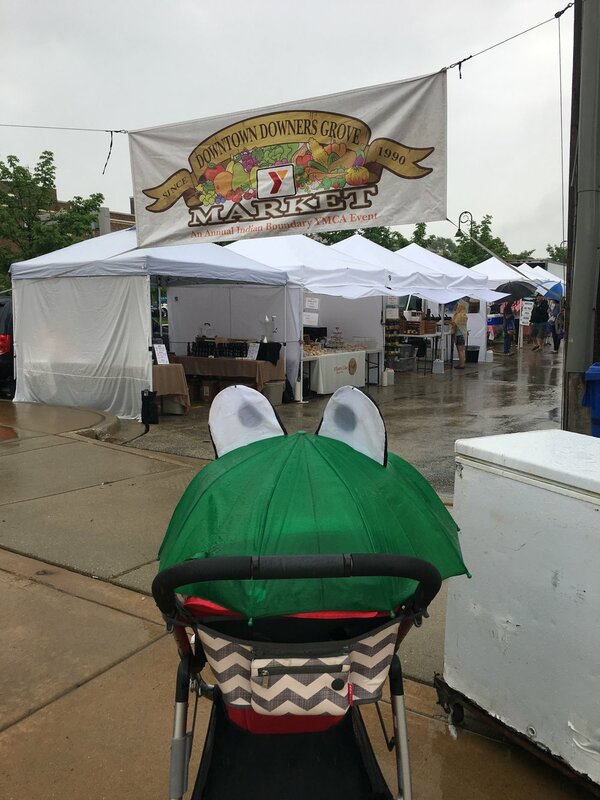 We went down to Olympia for breakfast and the Farmer's Market, we did some Southcenter Mall shopping, and strolling in Sumner (with crepes at Craft 19, of course). Josh and I can thank the grandparents for a date night, too! It's so cute because with both grandparents, Caleb got super attached. We so glad to have such loving family and the opportunities to see them. Don't discount the everyday, it's busy. I have laundry to fold, dinner to make, a house to clan, a dog to walk, a toddler to chase...all of which keep me away from the blog world. I hope you understand! I'll try to keep up with updates, but for now I hope this fills you in on all the happenings. A few days after Grandpa Don and Grandma Nada left, Grandpa John and Grandma Jan arrived. They came up to visit for New Years and for Caleb's Birthday. We had a great time having them visit. They even babysat Caleb overnight so this mama and dad could sneak in our first night away from Caleb and have a getaway! Guess what a mom and dad do for New Year's Eve with an almost-two-year old? Nothing. We go to bed at 10:30pm, open our eyes due to fireworks and then close them again. Then you wake up and it's another day. Who's with us on this one? But we did have a fun last day of 2017. Grandpa and Grandma O'Neill joined us for a trip to Point Defiance Zoo on a beautiful day. So clear that you could see Mount Rainier. It always appears so much smaller in your photos then it is in real life. The elephants and walruses were a hit as was a ride on the carousel. Weee! Considering Grandpa John and Grandma Jan's visit was so close to Christmas, we basically celebrated it again. 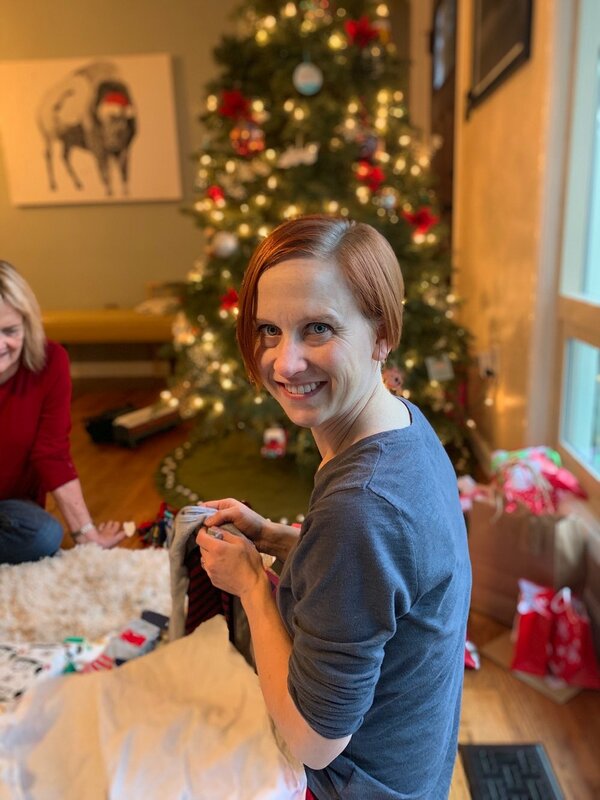 I got to make the meal I had actually planned for Christmas since we finally got our oven (read about the oven fiasco on this post). It was delicious! And Caleb got MORE presents. 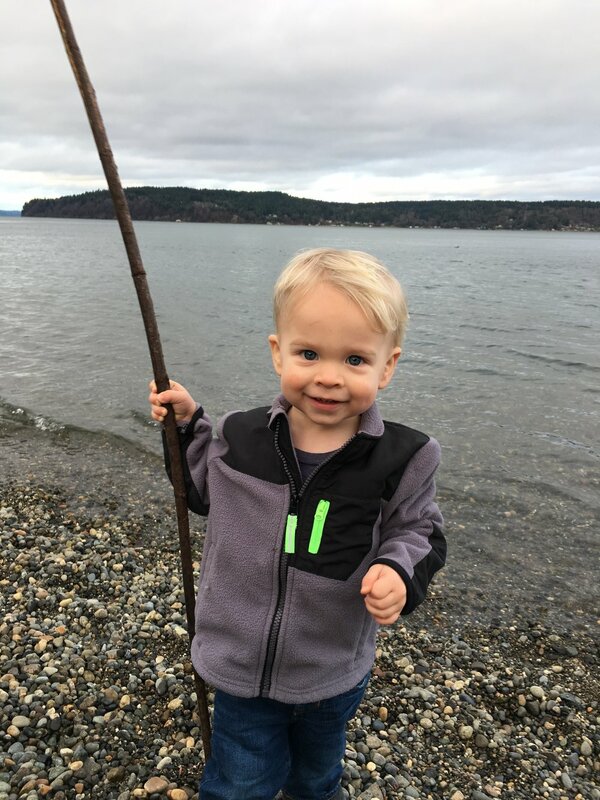 Since Grandpa John and Grandma Jan were game for a night with Caleb, Josh and I decided to take a night away from the little guy for the first time since he was born. We opted to stay nearby...just in case. We chose to stay in Gig Harbor at Raft Island. We found the most darling AirBnB. It was decorated with a nautical theme and still had Christmas decorations. Raft Island reignited our love for exploration. We had no idea this little island existed. It is a small island about 15-minutes from all the Gig Harbor action. You just cross a small bridge and you're on this quite, beautiful island. It was our little sanctuary for the night. It seems secluded and romantic yet not far away from fun activities (and home). During our getaway we enjoyed a nice dinner and then saw the third movie we've been to in two years (others movies included Beauty and the Beast and Dunkirk). We saw The Last Jedi. It seemed fitting since it was New Year's Day and the last Star Wars film we saw in the theaters was The Force Awakens which we saw New Years Eve 2015. It just so happened the next day the story of Caleb began. Caleb must be bound to like Star Wars. We spend the morning in downtown Gig Harbor. We ate at the pizza place I've wanted to try in forever, but has been impossible with a noon nap schedule. We also enjoyed a sampling at Heritage Distilling. Caleb spent some fun times with the wagon with Grandpa John and Grandma Jan. We also took them to the Children's Museum for a fun afternoon. It was a great visit, as always! So 2017 was pretty awesome. I took lots of photos, as usual. Here's the most liked from Instagram. Caleb, family, and food...seems about right. And now we can move into 2018 fun and posts!! Can you believe it?! My little baby boy is two! TWO!!!! Of course, we had to celebrate with fun, friends, family, and treats. Poor guy, he basically has a holiday birthday. 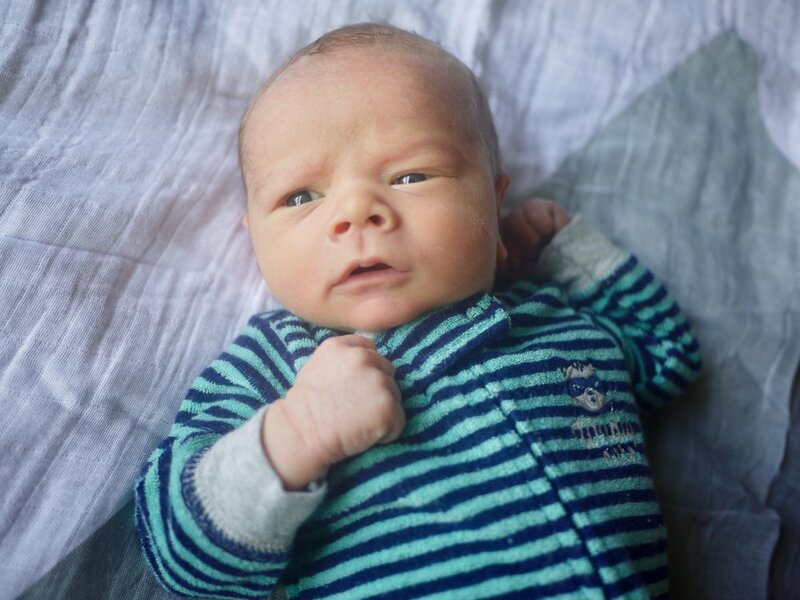 He was born January 2nd, so he's not quite a New Year's baby, but for me it all started on New Year's day so I say it counts. By his birthday, everyone is burnt out from Christmas and New Years. But this mom won't let the fun stop until after we party for his birthday! In fact, we celebrated twice - once on his actual birthday and again with friends at his party. 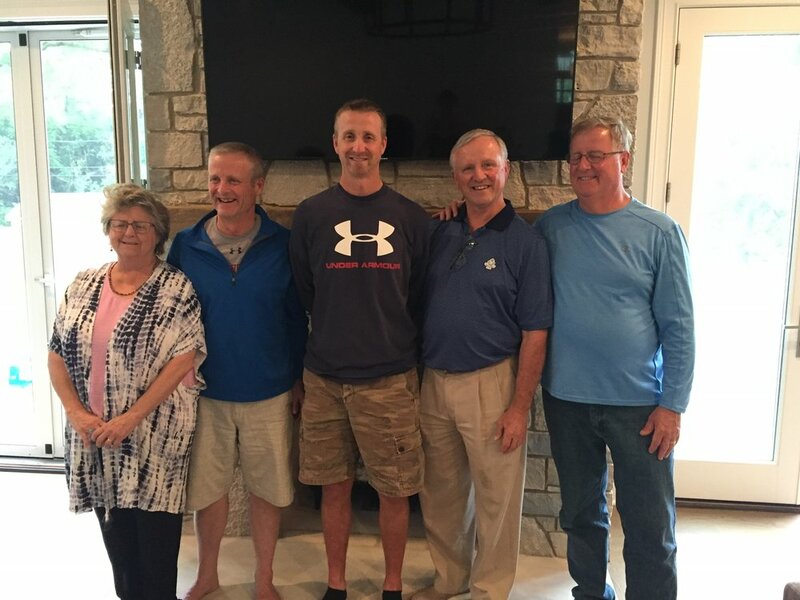 This year Grandpa John and Grandma Jan were in town to help celebrate. Then Dad/Josh took the day off of work. Lots of family around to give Caleb birthday hugs and laughs. As for treats, Caleb has two loves: frozen yogurt/ice cream and cookies. I think frozen yogurt beats ice cream only because it sticks to the spoon better so it's easier to eat. So, we all headed to Black Bear for some froyo. 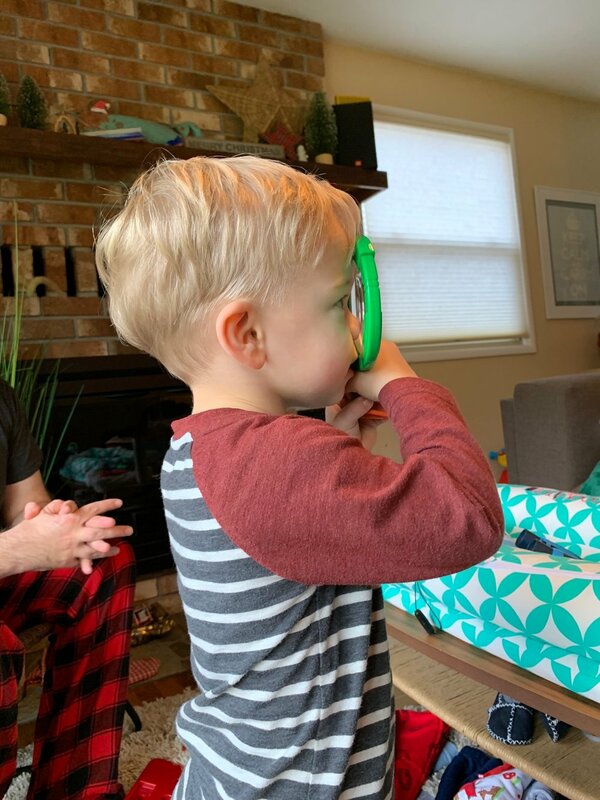 Caleb got some more gifts so we opened them. He LOVES his guitar from Grandma Nada and Grandpa Don. Seriously, he has his own jam sessions. Check out this video of him dancing. Grandma Jan and Grandpa John got him a wagon. We intended for him to sit and be pulled around, but he had something else in mind: pulling it. We should've know. I tried to get a cute picture of Caleb with this new sign, but he was more interested in playing with the sign. I usually take the birthday photos with the blocks, but the past few times he's thought it funny to knock them over - our wood floors fear him. So the birthday was a nice day of treats, music, and wagon walks. Saturday, January 6th we celebrated his birthday with friends. We had the part at the Children's Museum of Tacoma. This is one of his favorite places - we go at least once a week. It seemed fitting (and easier than having it at home!). I called his party, "Ready TWO Play!" We partied for two hours. The first hour was in a party room. The kids played with play-doh, the parent's chatted, and then we all ate cookies. Yup, cookies not cake. This kid loves cookies. It's probably the number one word used these days. He will randomly say it, too. Not to mention he thinks many things are cookies - crackers, circles, etc. He takes his fingers and pretends to eat and says, "cookie cookie cookie." It's too freaking cute. So I put frosting on a cookie and used that for the candle. I made Cake Batter Chocolate Chip cookies and Funfetti Cookies Supreme. He grabbed both cookies - two hands, two cookies, two years. Here a video of us singing happy birthday to Caleb. I love how he sways with the singing and then tries so hard to blow out the candle. Even though there is holiday burn out, we still had good friends show up to party! We are so thankful for such great friends. Caleb gets so excited these days when he hears his friend's name. We had Xola, Johann, Theo, Sebastian, and Liam. Yay for friends! The second hour of the party was free play fun out in the museum. Caleb's face was red and flushed from all the running and playing...a true sign of a good time. He was all giggles. As we were all leaving, the kids all sat on the little blue couch and said, "cheese" for a picture. It was the cutest thing ever. 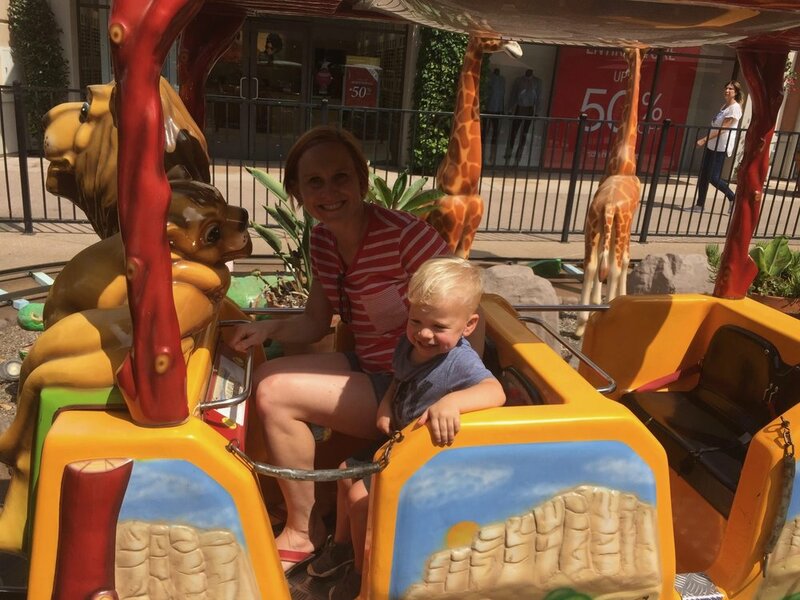 Wow, just too much fun - this mom is tired out! But what a great celebration. 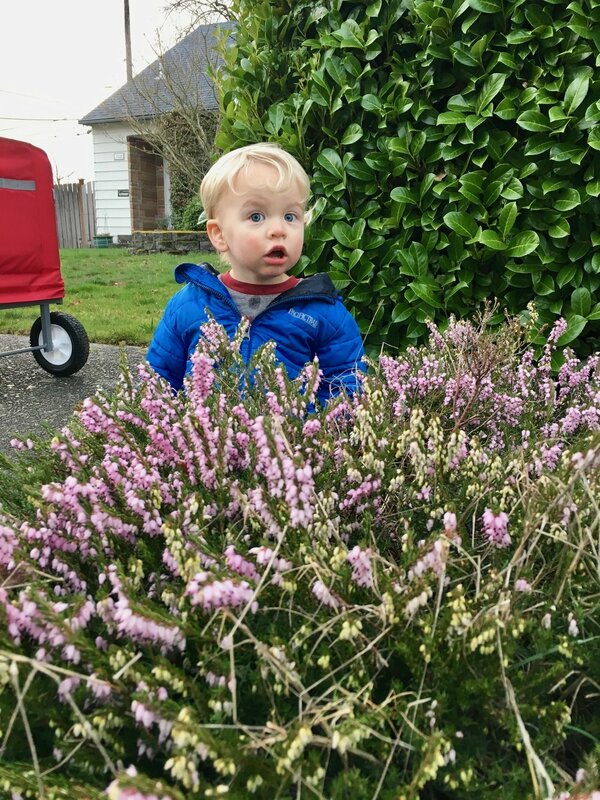 Caleb is my little toddler, now. So grown up. We love him so much and can't believe how fast time has past. 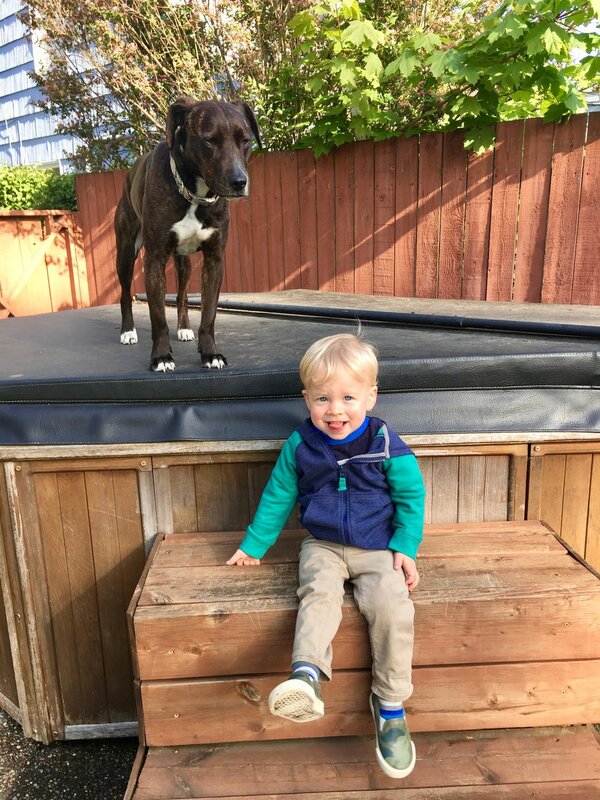 We are loving every minute with him (minus the tantrums...well ok, we will even take those as well, just because we love him that much). P.S. See all the birthday party photos here! Can you believe it, it's here?! We are in the beginning hours of Christmas Eve. I'm so excited to begin all the festivities. I want to savor these days - they go so quickly and it's been such a wonderful season. I am so thankful for all my family and friends. I hope you enjoy these magical days of Christmas. I send you my love and hugs. P.S. In case you missed it, our Christmas letter is up - just click "Christmas Letter 2017" in the top navigation. Or, I copied it below as well. Merry Christmas! We feel so blessed to have enjoyed another big year in the Brown household. It’s been full of family, trips, and adventure. This year started with Caleb celebrating his first birthday. On January 2nd, we’ll already be celebrating his second birthday. How did this happen so fast? 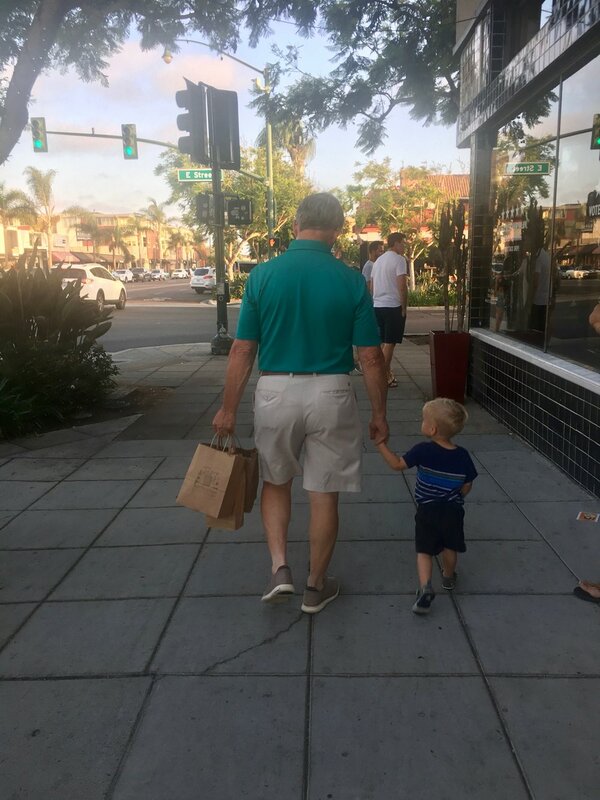 Probably the biggest development for out little guy was learning to walk, or should I say run. He is a fast and curious little guy, which can be a recipe for trouble. Lucky for us, he is a real sweetie! He waves to everyone and everything: people, buses, dogs - you name it, he'll wave it! He even gives the phone a hug and kiss when the grandparents are on FaceTime. He’s also started to say some words. His favorite word is “go go go” but its a close race with "no no no." He's also termed his own word, “go-kay,” which we believe means “go, okay!”(or maybe cookie, haha). He is growing so fast and we are really treasuring all the cute moments. For more check out the monthly updates, his first Halloween going trick-or-treating, and Easter. We were blessed with some awesome trips this year. 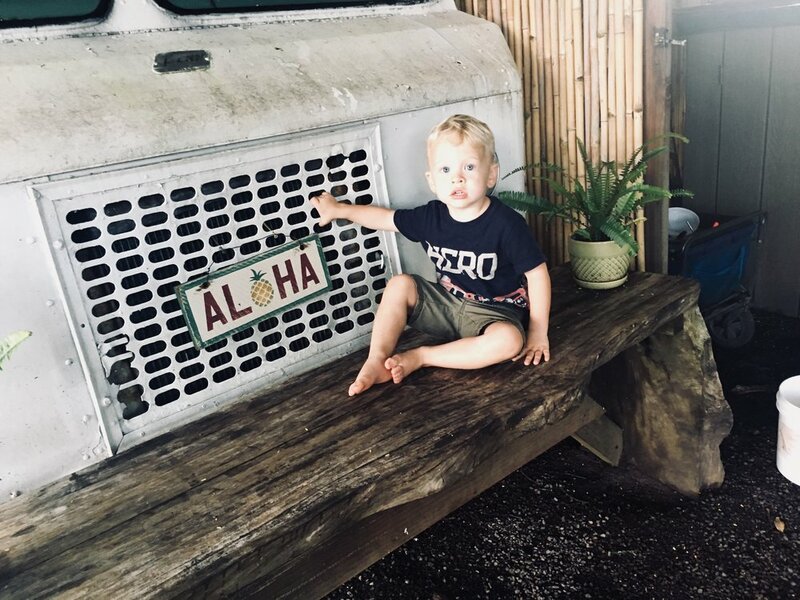 In September, we joined Grandma Nada and Grandpa Don in Kauai. The 5-1/2 hour flight was rough with a toddler but was entirely worth it. Josh and I got a few date nights thanks to the grandparents! We also enjoyed some great family time as we soaked in the vitamin D, sunshine, and warm water. 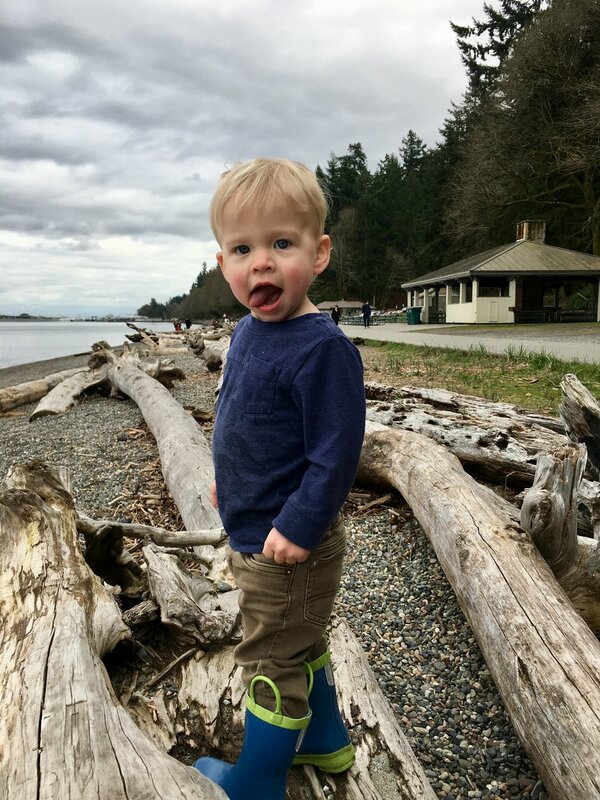 Caleb absolutely loved the beach too. 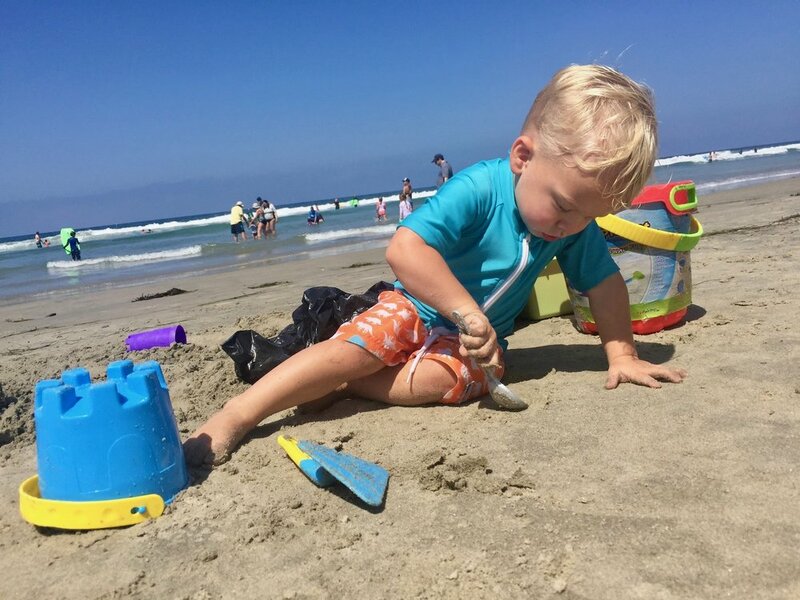 He loved everything: playing in the sand, playing in the water, lying on the boogie board, and running on the beach. It was the perfect vacation for us! Earlier in the year, we spent a lovely extended weekend in Portland. We realized we hadn’t been down there to visit since we moved to Seattle, which is funny since it’s only a few hours away. Portland has really changed since we were there, and the experience was a lot different with Caleb. However, we had a great time exploring and eating some delicious food. 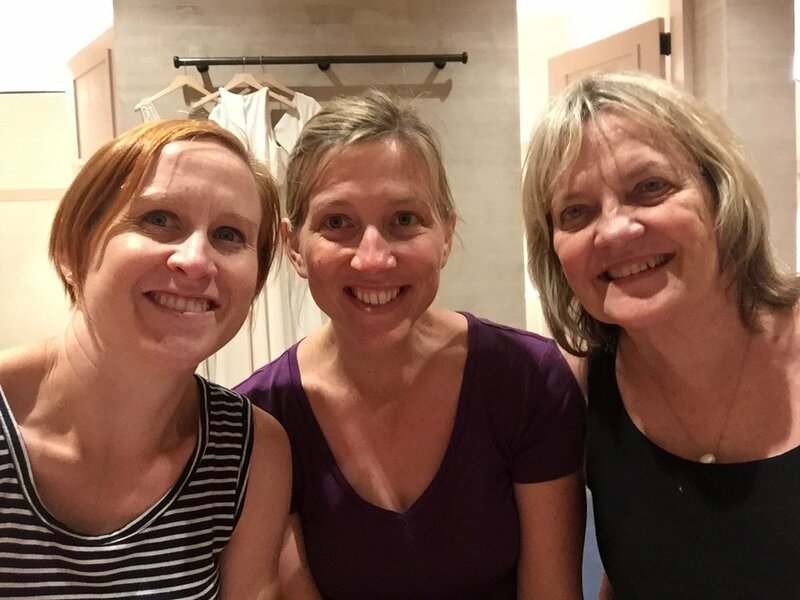 The three of us also made a special trip down to San Diego in the summer to celebrate my dad’s 70th birthday. Of course, there was some exceptional wine and food as part of the celebration. We also got the opportunity to get photos of all of us together, as part of a gift to dad. Josh changed jobs and is now working for the Washington State Nurses Association. They were one of his clients and hired him to help with Membership and Digital Transformation projects. One of the biggest benefits of this job is it’s closer to home and the work hours aren't quite as intense either. I am still doing the stay-at-home-mom gig. In my project manager style, I’ve got Caleb and I on a schedule to keep us busy. Every morning we have an activity planned. 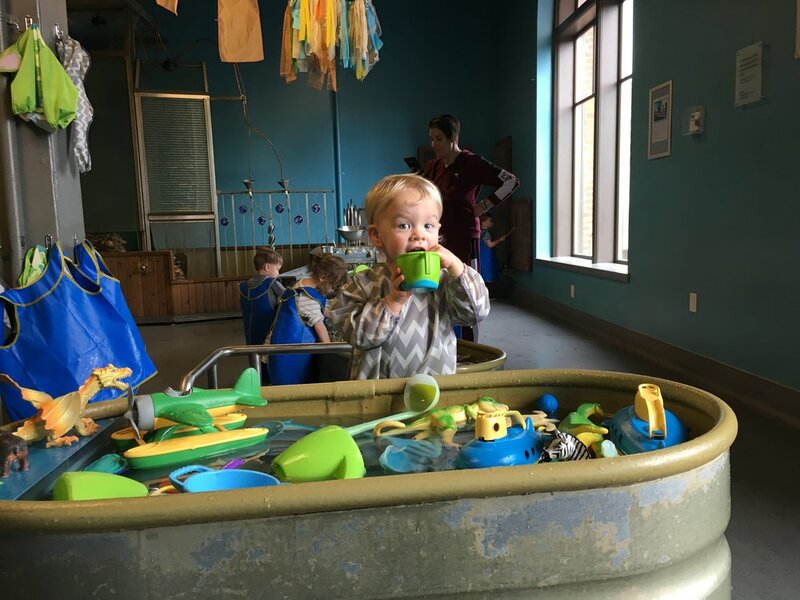 Our favorite place is the Children’s Museum of Tacoma. We are so lucky to have this near home. We also frequent the YMCA for swimming lessons, running around at Toddler gym, or this mama getting a yoga stretch in. Our pup turned three in December. She still acts like she’s three months old, though! 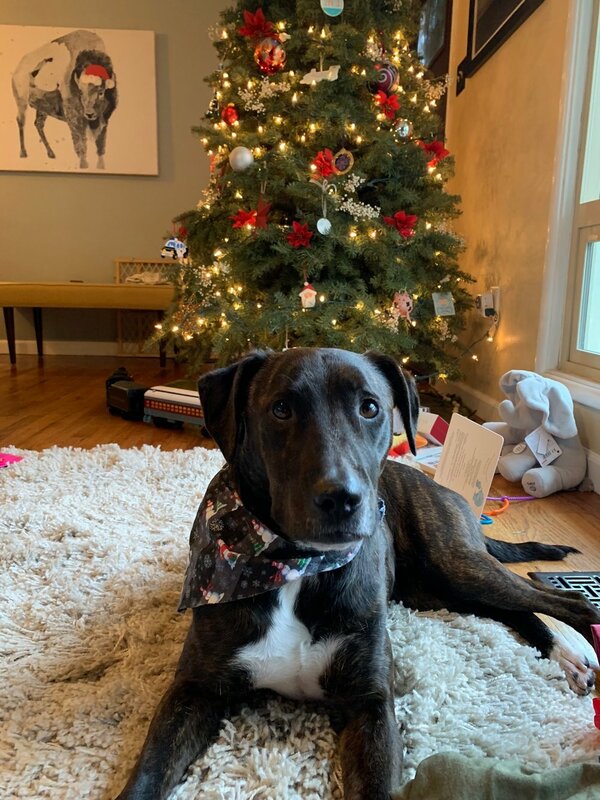 We think we finally pegged the type of dog she is, a Plott Hound. Or, at least, she definitely has that in her for sure. She still loves to go to the park and chuck-it as well as stick her head out the window when we drive around. The latter brings many smiles to other drivers faces, as they see her with her ears flapping and an expression of pure joy. 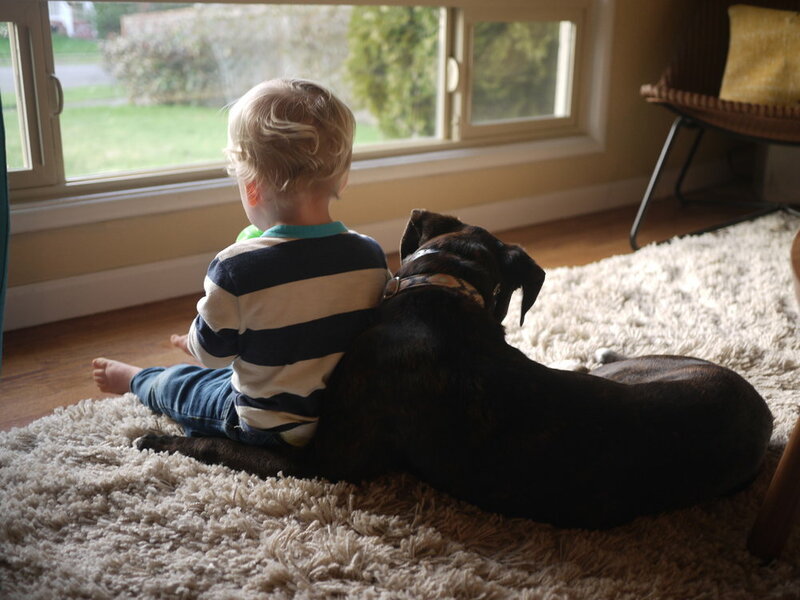 She’s great with Caleb, who now sort of walks her, and is a big part of the family. We have officially lived in Tacoma for over a year now and we are loving it. 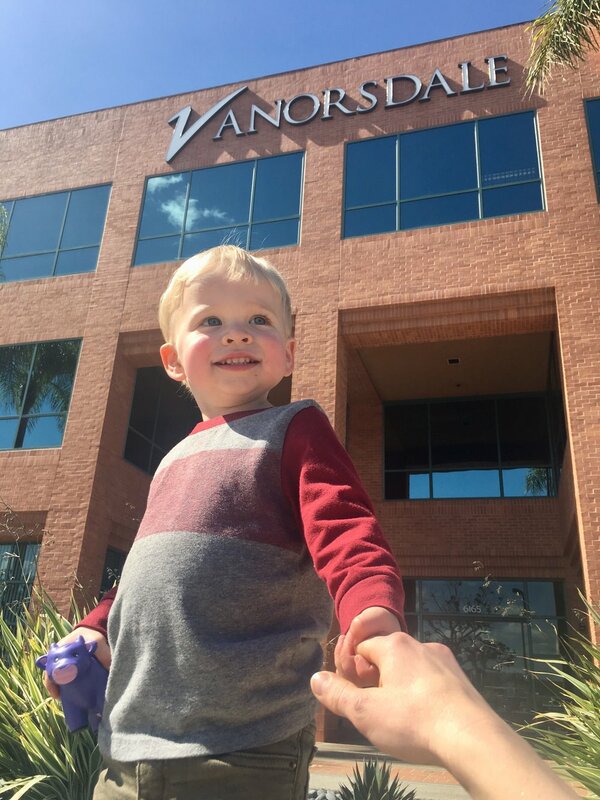 It has turned out to be a great place to raise a child and we love the community. We are excited to be here and even more excited to see it grow. Oh, and having our own house is pretty swell, too! This year has been full of such joy. We hope this holiday season is bringing you cheer and merriment. This season has been busy, busy, busy, busy...so busy. But also fun, fun, fun, fun!!! I love Christmas. The season started off going slow, but now I'm like "wait...hold on! Slow down!" Can you believe Christmas starts this weekend? So excited and yet I want the season to continue for much longer. I'm going to keep the writing short, and the photos long on this one (well, like most of my posts these days, haha). Of course, we had to see Santa. Caleb handled it very well. No crying, in fact. Although, he was WAY more interested in the candy cane than in Santa. He wasn't sure why he was sitting with Santa, but if it meant getting to eat a candy cane, then he was all for it. I was pretty surprised to find how much he likes candy canes. He never ceases to surprise me. Check out last year...the Santa visit was much smoother this year. I heard there were reindeer at Watson's Nursery, so we made a trip one Sunday afternoon to say hi. Caleb did actually waive and say "hi" to the reindeer. He does this with most animals. There was a cute little shop and Christmas trees (although, we got a tree at a place closer to home). We got our tree at the same place as last year, Gardensphere. We put Caleb in the stroller and Asha on the leash, and walked over to it. It's a great family owned nursery, so it's great to support them. Plus, they do free delivery and setup. Sold! We got the tree all decked and glowing. I love the baby's breath and poinsettias on our tree. The baby's breath idea is from the Brown family and the poinsettias from the O'Neill family. Caleb just loves the tree. He says, "wow" whenever he sees it and insists the lights be turned on. He also likes to bring me ornaments. We joined our friends Bri and her son, Johann, at the Festival of Trees in Tacoma. 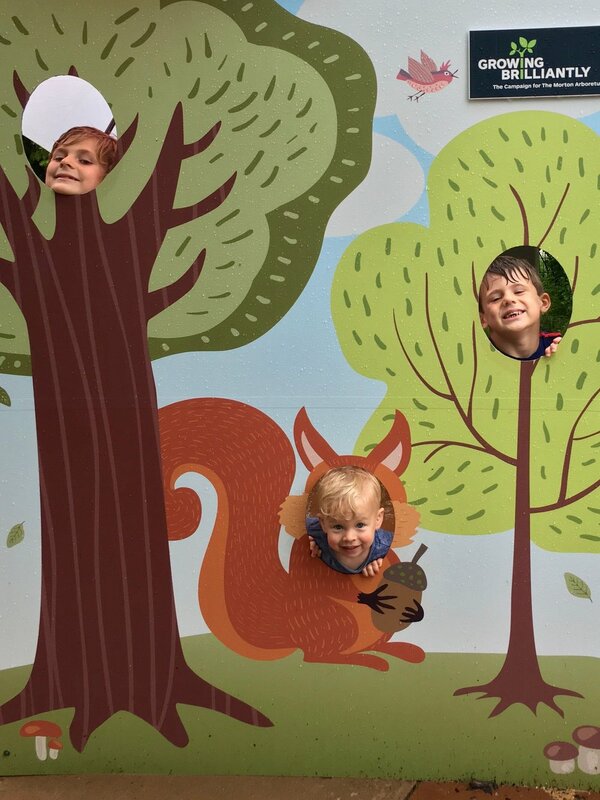 The boys loved the trees - each with a theme. They especially liked the trees themed as kids gifts. Soooo tempting to just crawl under the rope (well wait a second, they did try that). I bought a gingerbread kit at Costco, so Caleb and I put one together. Caleb preferred to eat the gingerbread man and candy, but he did get some candies on the house. We went to Fort Nisqually's 19th Century Christmas, which as quite fun even thought we were cutting it close to nap time. 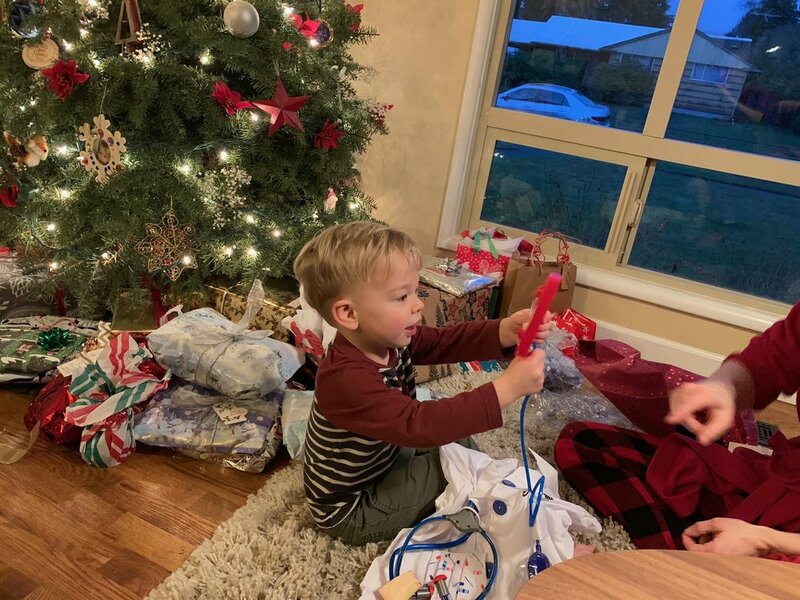 Father Christmas was fun, and again Caleb enjoyed a candy cane. 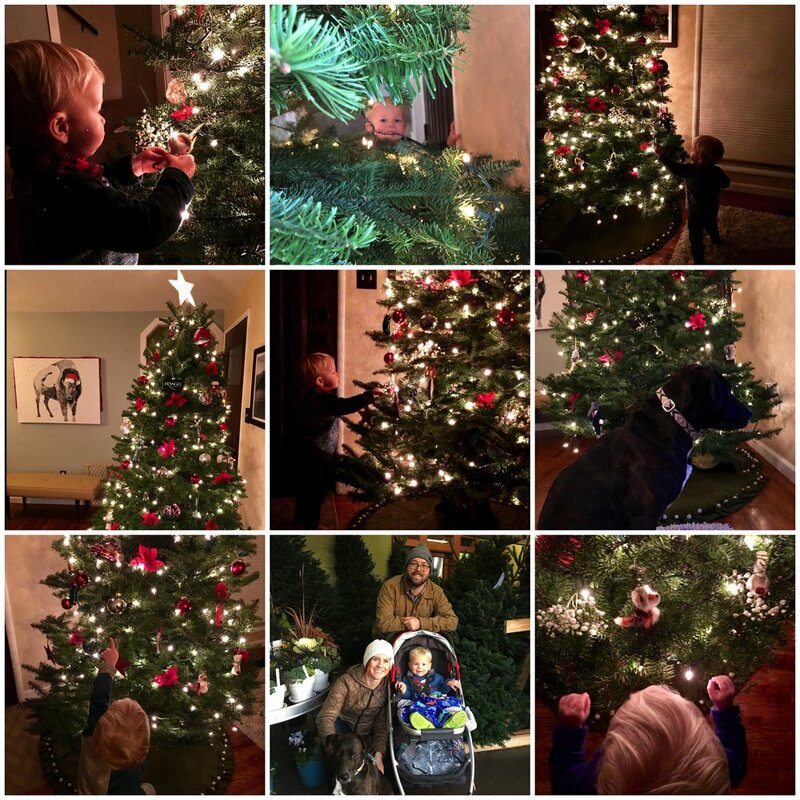 We went to a few craft festivals, shopping, and walking the neighborhood and seeing lights. My favorite was when Caleb first saw the stockings. He asked what it was and I said it as a stocking, so he tried to put it on his foot. Too cute! I got out all the decorations and the house is full of wrath and spirit. I love it. Caleb enjoyed the red wagon after visiting Santa. Isn't that sweater the cutest? Caleb loves it too since it has a truck and a dog. The Point Defiance Zoo lights up each night during the season for Zoolights. 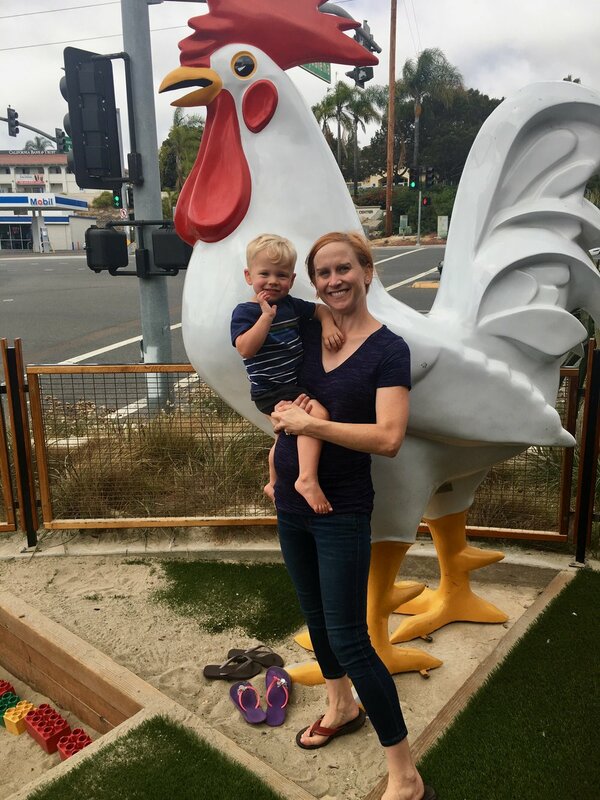 We went with our neighbor and friends, Krissy and her son, Sebastian. 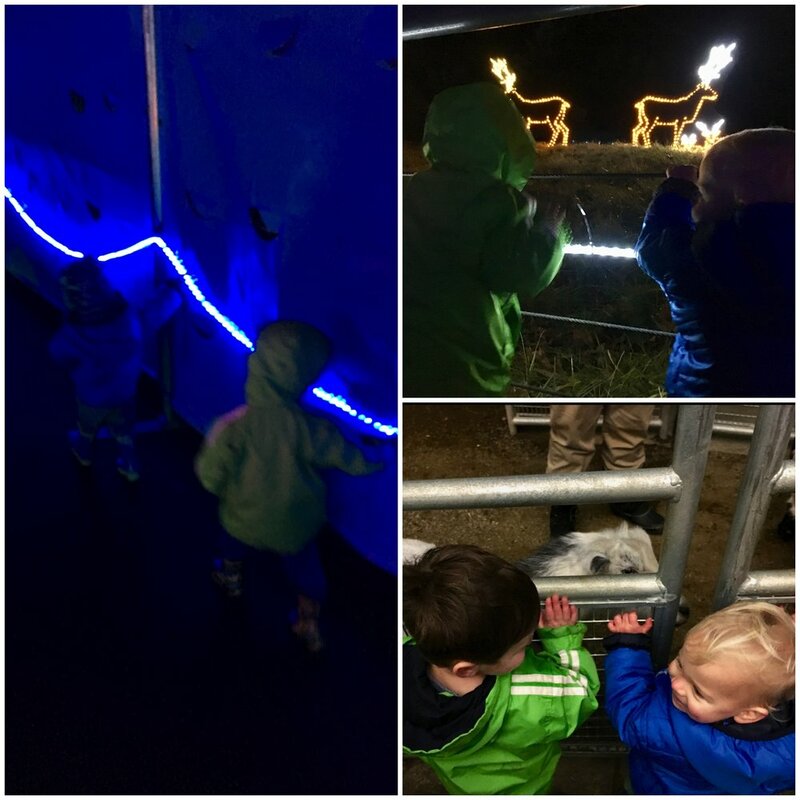 The lights were beautiful and the kids enjoyed the goats and carousel. A bit chilly but good fun! We have a few more days to continue to celebrate. I'll be sure to fill you in on all our festive fun!! If you know me, you know that I love to bake. I also love cookies. Therefore, I love baking cookies and then eating them. In fact, my parents tell me one of my first words was cookie. Not surprising, Caleb also has discovered a love for cookies. He takes his hands to his mouth, and enthusiastically says, "nom nom nom!" He will do this with pictures of cookies and even plastic toy cookies. It's hilarious. 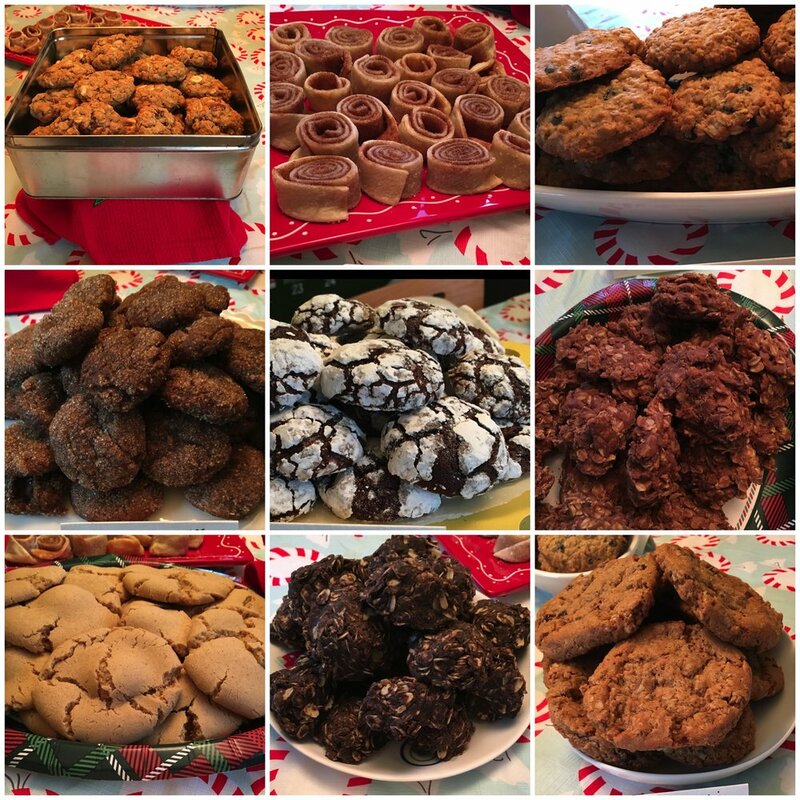 Our love for cookies must be shared, which inspired a cookie exchange. It seems December hits, and you never have time to make all the varieties of cookies you want. Then Caleb came along and baking all the cookies became even harder. 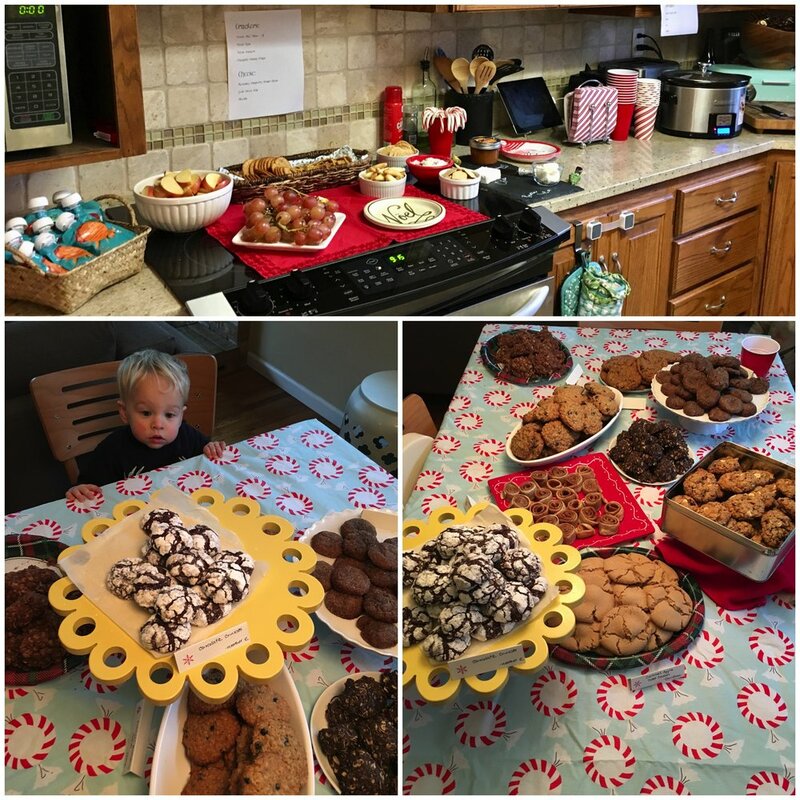 So last year I started a cookie exchange party with all my mom and baby (now tots) friends. 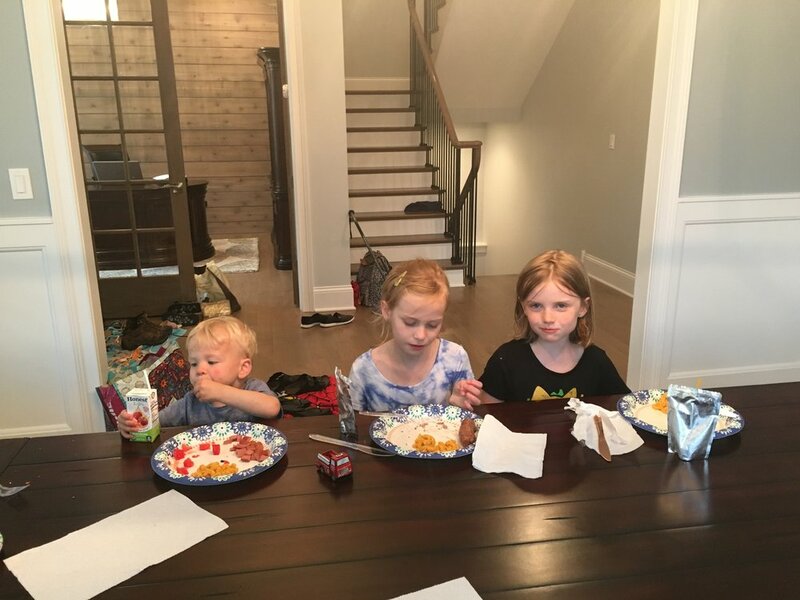 It's so much fun to get everyone together to enjoy cookies and conversation while the kids get out all their energy. Win win! Everyone liked it last year so much that I just had to do it again this year...and now it'll be the annual cookie exchange. I'm committed to it now my friends. Let me share some of the party fun in pictures because the pictures tell it all. Here's the cookies (start top left): Oatmeal Cranberry, White Chocolate, Walnut Cookies*, Cinnamon Sugar Pie Pinroll Cookies, Oatmeal Blueberry Cookies, Ginger Sparkle Cookies, Chocolate Crinkle Cookies, No-Bake Chocolate Hazelnut Cookies, Caramel Apple Cider Cookies, No-Bake Peanut Butter Chocolate Cookies, and Oatmeal Raisin Cookies. *These were my cookies. There is a story here about our oven, etc. I hope to share that with you soon. But for a sneak peek: the world was against me making cookies. 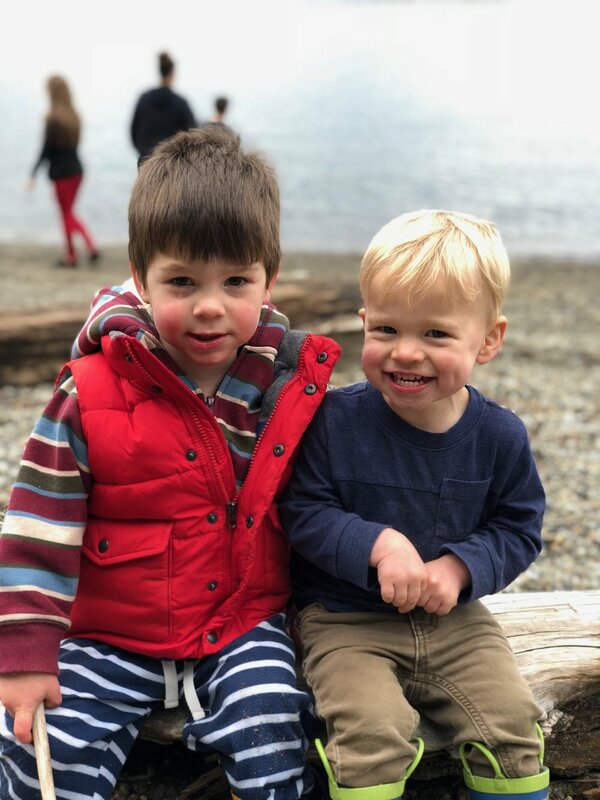 Kids starting from ~6 months to almost 4 years old. Sadly I didn't get a great photo of the baby, but he's a cutie! The top photo is everyone but blurry, and the bottom photo is not everyone but better focus. I made some warming spiced apple cider and lots of snacks, but the cookies were the main dish. ;) And I had to share the one of Caleb. I don't know how many cookies he ended up eating, but he kept snagging them off the table, the little stinker. Apparently, we have a chocolate lover on our hands, too. 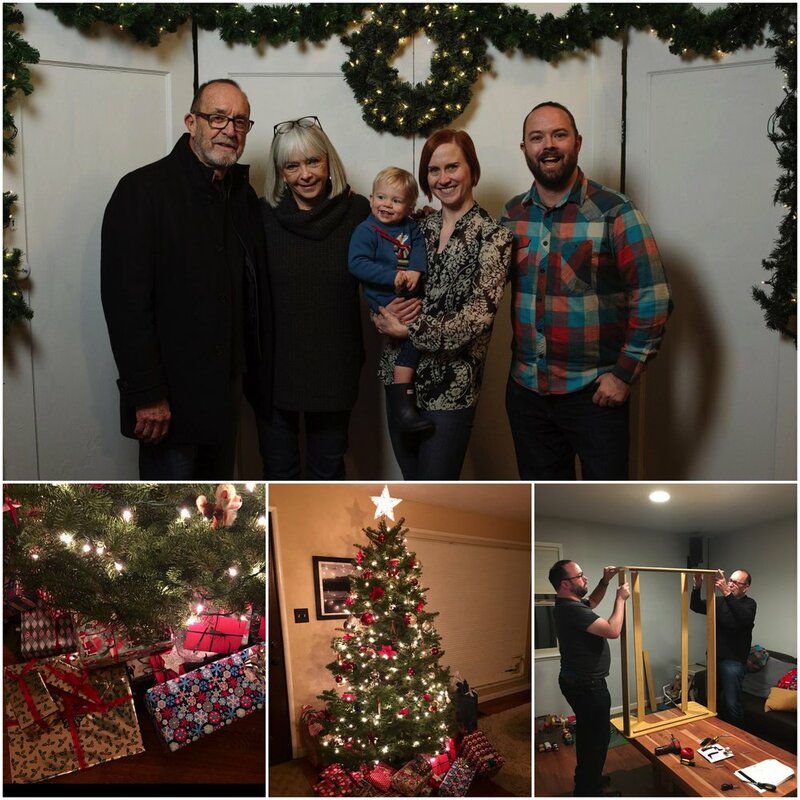 Such a great time with friends and really helps get me into the Christmas spirit. Love this day! As of December 2nd, we're at 23 months old. 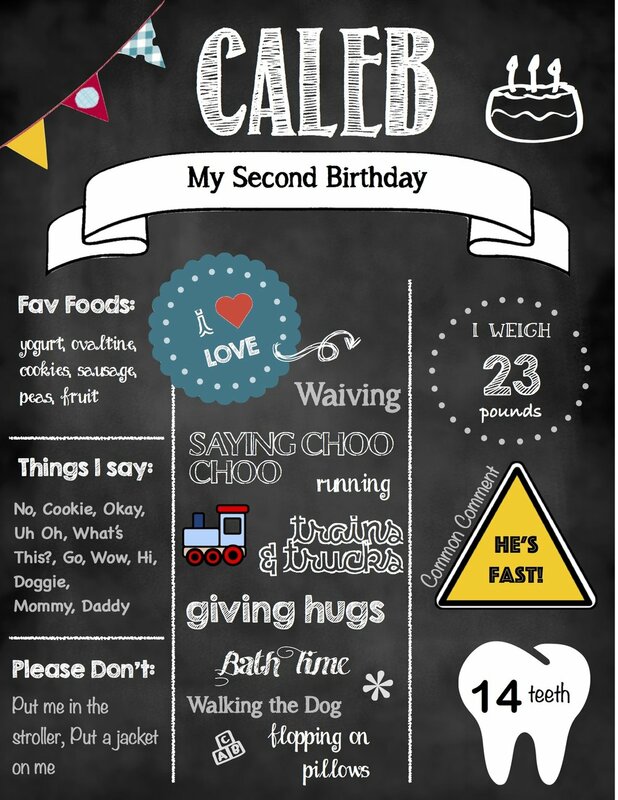 Can you believe it, only one more month and Caleb will be the big TWO?! Please tell me they won't be terrible. ;) This age has been particular fun - tiring for mom running after him - but he's totally got the cutest personality. The cutest development this past month is the animal noises. He loves the elephant, lion, monkey, and hyena noises the best. But his very favorite noise is the siren. He also loves to flop on soft things like piles of pillows and stuffed animals. I know I'm his mother, but doesn't he just have the sweetest smile. It's so full of joy and love. Caleb just loves his daddy. Throughout the work week, he'll babble about daddy. It's cute to see him watch daddy go to his car to take off for work. He waves and repeats, "daddy!" We got the opportunity to spend a week down in San Diego with Grandma Jan and Grandpa John. As always, we enjoyed some froyo/ice cream, hugs from the grandparents, and sunshine. You aren't a toddler if you aren't full of silliness, right? Caleb has plenty of it. And it's so sad when fun is on the horizon only to find the zoo is closed. Look at that sad face at the gates. Don't worry, we got some fun in at the park instead. These are the best, especially at friend's houses where we can play with all new toys (oh yea, the friends are pretty cool, too). It was bittersweet for me to see the baby curls shorten, but he's still got the cutest small curls going on. Surprisingly, he had a blast getting his hair cut. How could he not when they put him in a car, hand in trucks, and put on his current favorite show, Super Wings. He didn't want to leave! Thanks to Wild Child for making it a fun first hair cut experience. This kid would keep going and going and going if I didn't make him lie down to sleep. Why walk if you can run? Cars and trucks are awesome. And construction is fascinating. Oh, and water and puddles. So much fun to have in life. Favorite sweater. Spinning. Wee Wee Wee. This season has been a blast so far. He is way more into it than last year. Every time he sees a Christmas tree he says, "wow!" So full of wonder and spirits. Yay for a fun 23 months! Wow, Thanksgiving is here! November flew by so quickly. Soon we'll be celebrating Christmas. But I don't like to jump so readily to Christmas. I insist on waiting on decorations and music until after Thanksgiving. Thanksgiving is a special holiday and deserves to be the center of our hearts and attention. It is a day to give thanks and celebrate with friends and family. Oh, and to eat turkey. Speaking of eating, my pumpkin pie is baked and cooling. So if nothing else turns out, at least we have pie. And that's the most important dish, right? The pie. Okay, maybe turkey is the star of the meal. Or the potatoes? Gawh, I love it all. Pumpkin Pie with Streusel Topping --- Yum! The turkey will go in at 3pm since it's a small bird feeding just the three of us. And in reality, it's just the two of us probably eating because Caleb only eats yogurt, oranges, and Teddy Grahams. I kid...sorta. Asha might get some bits off the floor, if she's lucky. If Caleb's eating, her chances are pretty good. Back to the true meaning of thanksgiving: giving thanks. I am so thankful for my dear, thoughtful husband. My adorable, sweet son. My loving parents. My fun and awesome sister. My caring in-laws. My neurotic dog. My awesome family. And my fantastic friends both far and near. I am also thankful to live in a beautiful town in a great country. Caleb is thankful for puddles, boots, sticks, and Teddy Grahams. These photos are from our walk along Owens Beach this morning. I am also grateful that Caleb allowed me to put on his rain jacket without too much fuss! I'll try to write a post later about the food because it is a day of feasting after all! I loved this card from my in-laws and thought I'd share it with you, friends. Happy Thanksgiving! Fall is my favorite time of year. I love the flavors, smell, colors...everything! We had an exceptional fall this year with great weather. 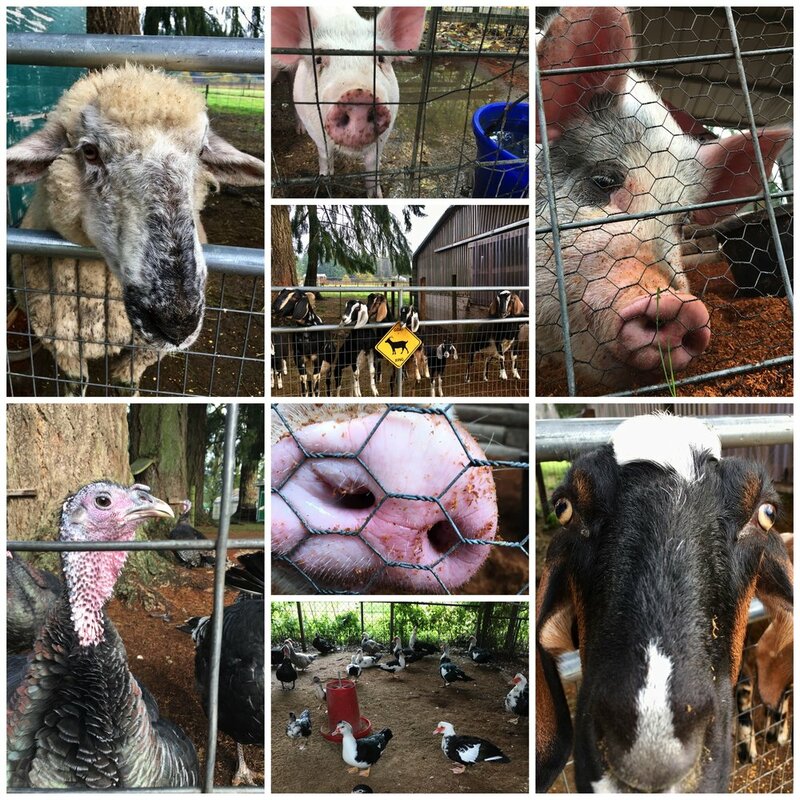 We started a little tradition last year by visiting Lattin's Cider Mill and Farm (check this post out, the bottom has some photos from last year that you can compare to this year). 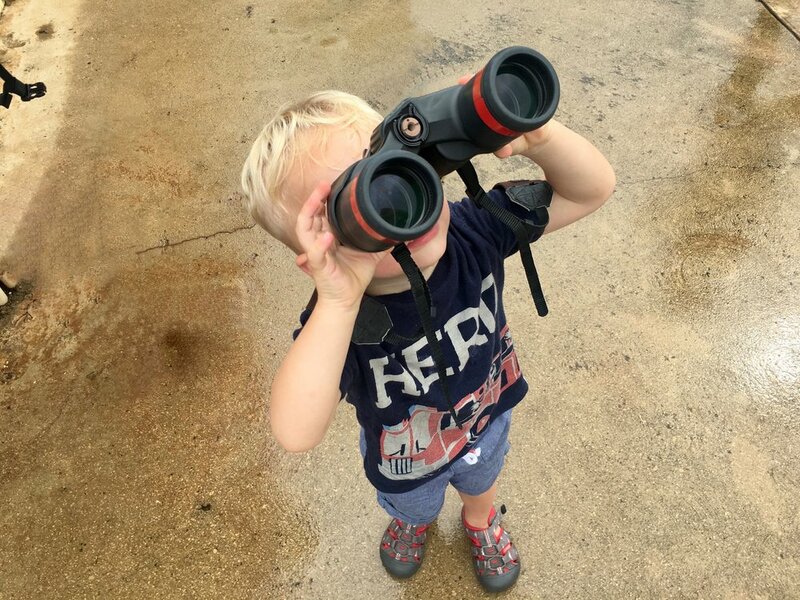 It was even more fun this year because Caleb got super into the animals and the donuts! Caleb got a kick out of feeding the goats and sheep (see video). He even waived to them - too cute! He tried to feed the pigs some oats, but they weren't too interested. The goats, though, they were definitely interested. Standing up over the gate interested. The animals were totally fun. I think the pig was a favorite with it's oinking. Look at that snout! It's also a cider mill, so we loaded up on apples. 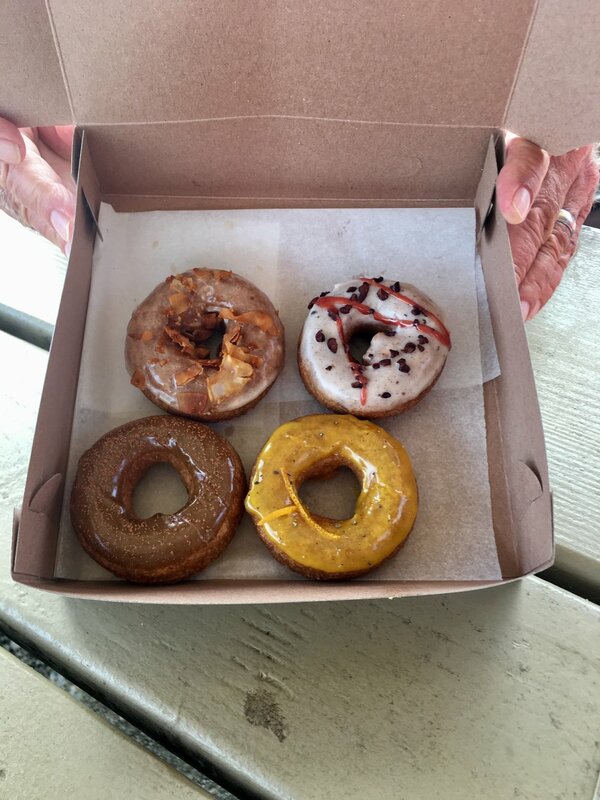 They also have apple donuts made fresh at the mill store. Caleb sucked the donut down, man. This kid is usually super picking and only takes nibbles of past donuts, but this one he devoured. He's still eating it in the apple tree photo, hahaha. It was a fun little family adventure together and made for a great day! It'll probably shock me next year when we go and I look back at this post to compare Caleb's growth! Now, after tomorrow (Thanksgiving) we'll be on to Christmas and winter everything! It seems I rarely get around to sharing my visits down to San Diego with you. With Caleb under two years old, he flies free on my lap so we've taken advantage and tried to make several visits this year. This past trip down, at the beginning of November, was our last trip with him under two. Next time we have to pay! Although, having that seat will be really nice. We've gotten an empty seat next to us every so often and it makes a world of difference. 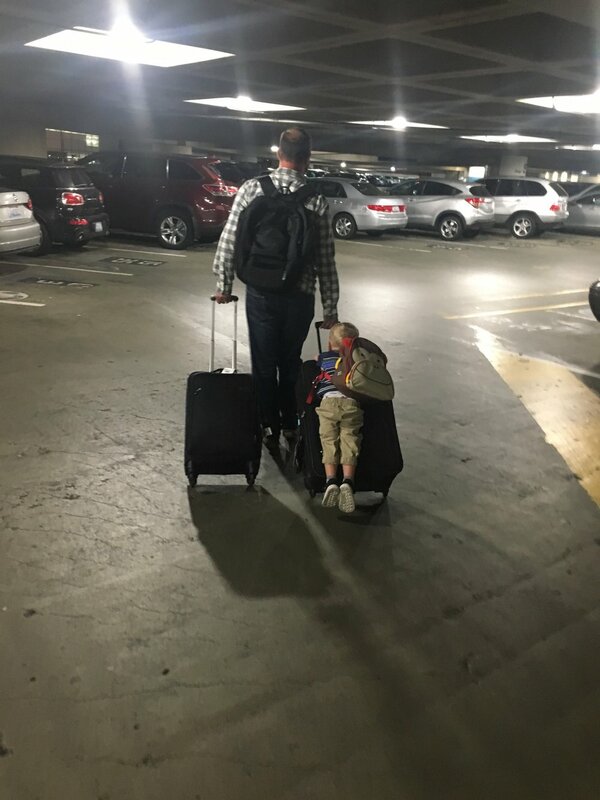 So even though we will have to pay, at least it'll make for a more pleasant trip (and let me tell you, you need all the odds in your favor when traveling with a toddler). 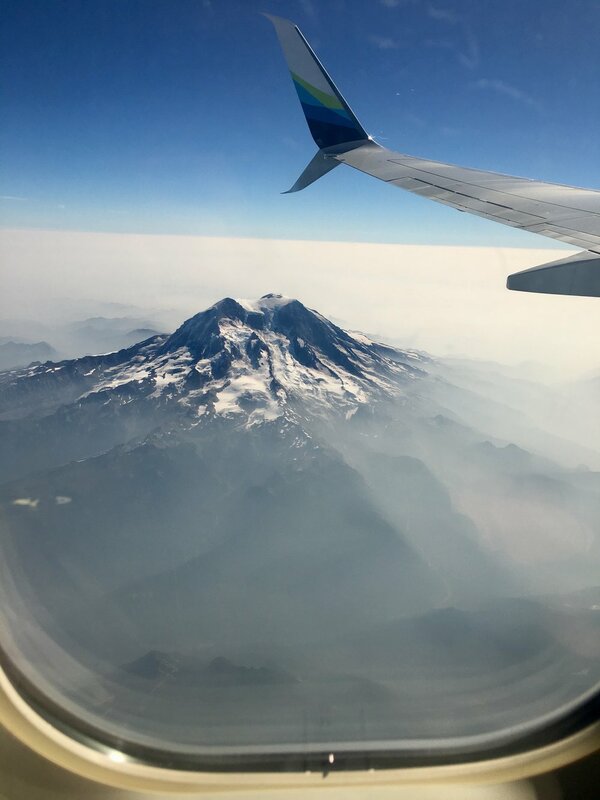 Lucky for us, we visited San Diego when the beautiful fall weather in Tacoma switched to more wintery weather. They had cold temperatures, snow, and rain. Perfect timing (sorry Josh - he had to stay for work). So we got to extend our intake of Vitamin D for an extra week. And had a bunch of fun with my parents, or should I say Grandma Jan and Grandpa John. After seeing Caleb have so much fun in Kauai at the beach, we made an effort to go in San Diego. We didn't go in the water (brrrr! ), but we had a ton of fun playing in the sand. Moonlight Beach is so great and it's fun to take Caleb there since it was a beach I went to as a kid. What's a visit with grandparents without a little ice cream? A new favorite on our past few visits has been Handel's Ice Cream. Oh man, it's good. Of course, I have to go to Golden Spoon frozen yogurt. 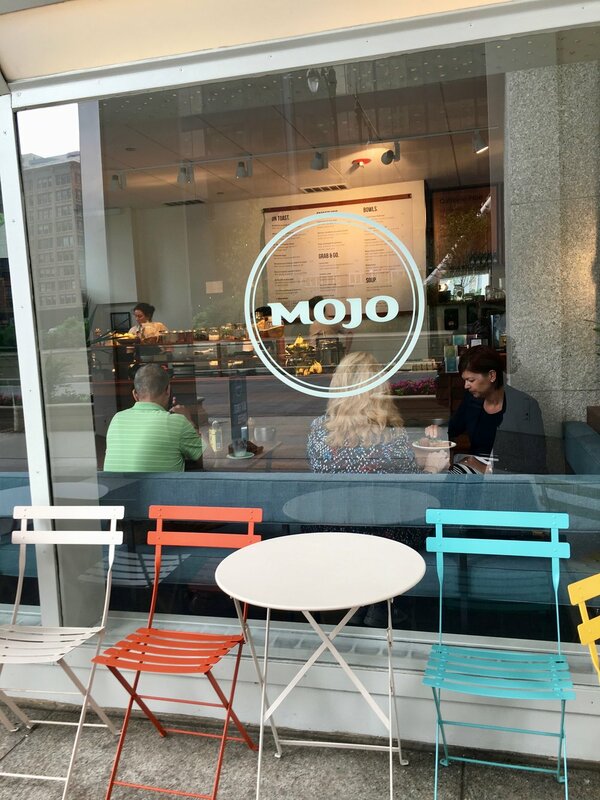 I used to go there for froyo when I was younger, too! Caleb definitely takes after me in his love for frozen desserts! I used to always ensure we made a visit to Honey's for my favorite muffins. However, I found Lofty Coffee which makes dynamite salted caramel lattes, and it has won as my latest "must visit each trip" spots. This time, we found Ironsmith Coffee and it competes with Lofty. It's a family winner as well. You know my dad likes a place if he goes in and stares at the pastry case a second time. We had best luck with breakfast at Ironsmith, too. Caleb was still adjusting his schedule (after a cold, flight, and time change) and feel asleep on the drive to the coffee shop. We found a parking spot right in front, opened the car door, and placed our table next to the car. We enjoyed a toddler-free coffee and breakfast. Score! We made a trip over to UTC, one of our family favorite malls. They recently did some changes and updates to the mall and it was totally different. It's quite the hip mall now. There was a Nespresso store so we got some pods for our machine back home. And Caleb enjoyed walking around outdoors. Nothing beats just staying at home and playing with Grandma and Grandpa, though. We're so blessed to get to spend time with grandparents and go on these trips! This was another great time in San Diego!